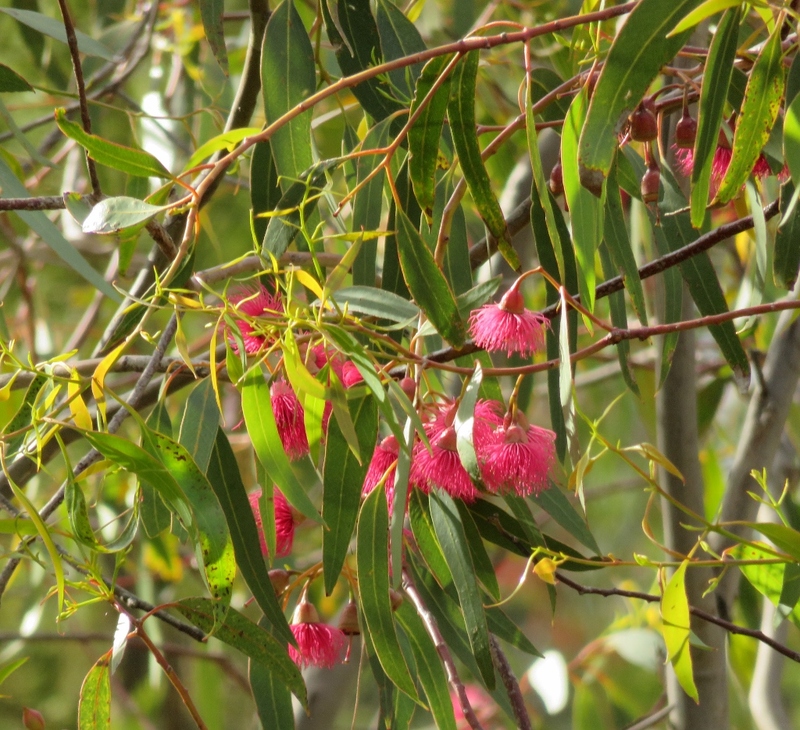 Canberra’s spring: birds, plants and a BraveHeart..
Canberra in spring, sunshine and flowers…. it is enough to make your heart sing. 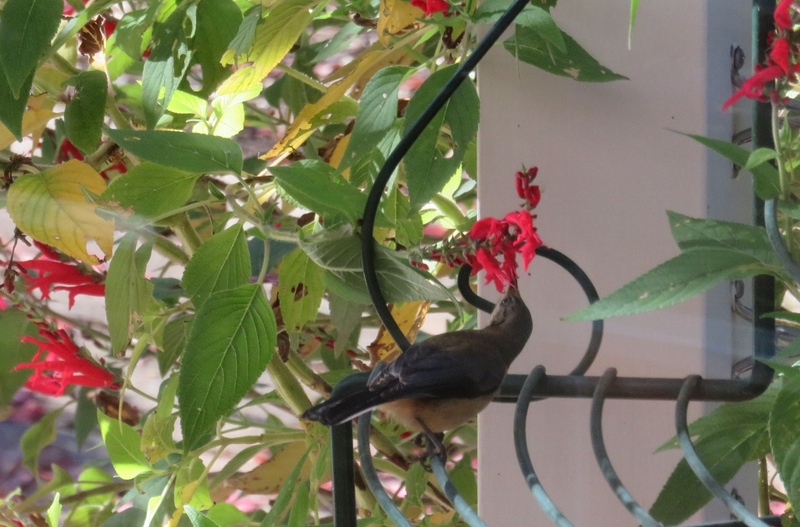 Every day during winter the beautiful little Eastern Spinebill came to feed from the remains of the Peppermint Sage in our garden. 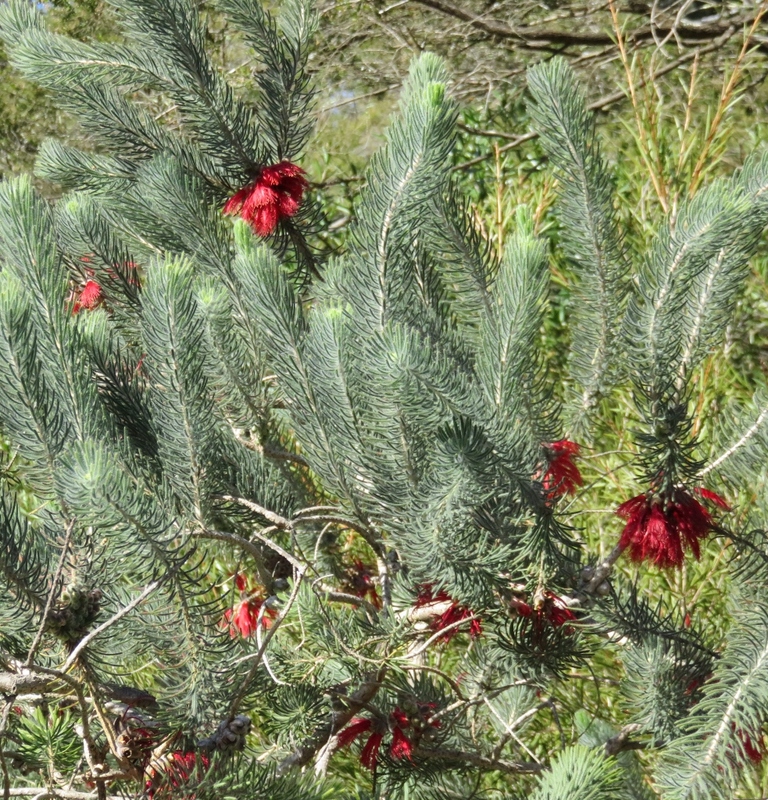 The Eastern Spinebill is an important pollinator of many native and non-native plants. 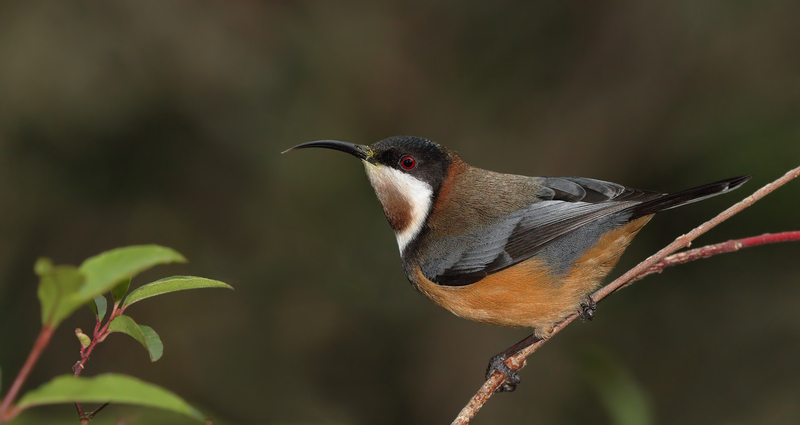 The Eastern Spinebill is a Honeyeater, and its long curved beak can reach nectar from native and non-native flowers. 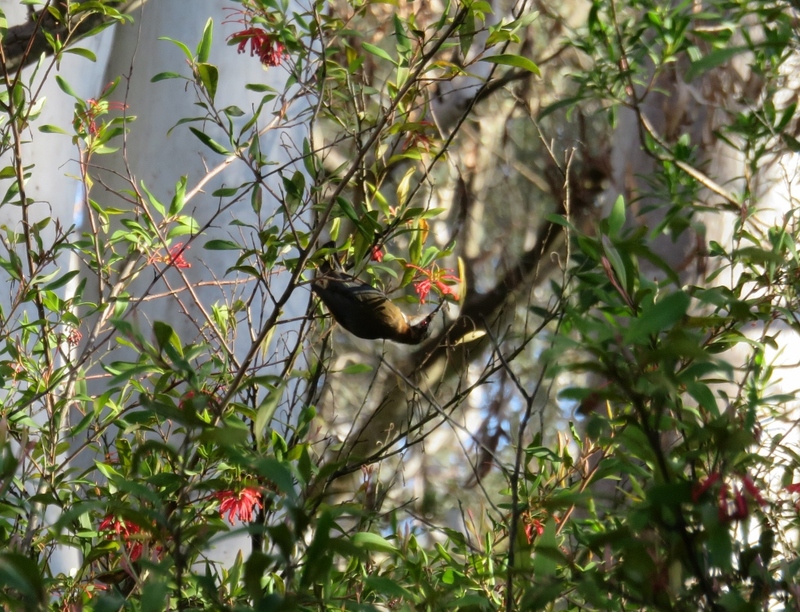 They are often mistaken for Hummingbirds, (including by me) as they can hover over a flower in the same way a hummingbird does, but generally they perch on branches like other Honeyeaters. 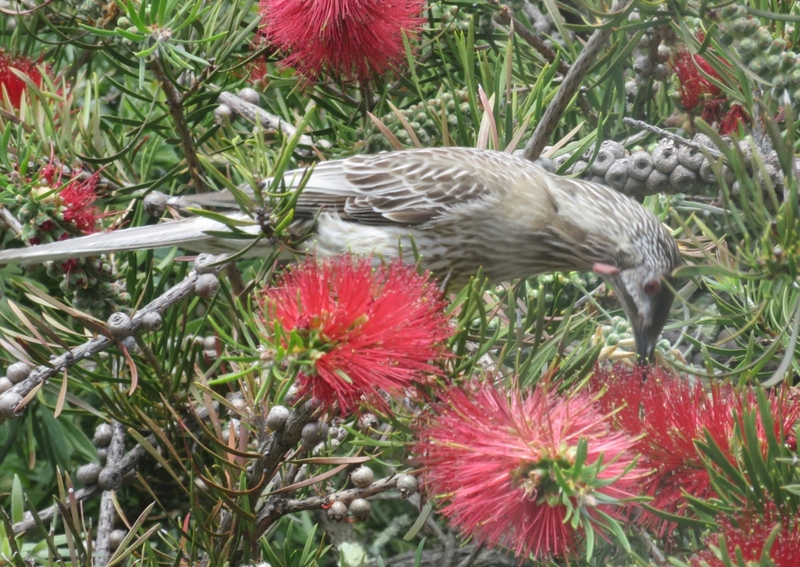 The moment spring arrived, so did the Red Wattlebird. 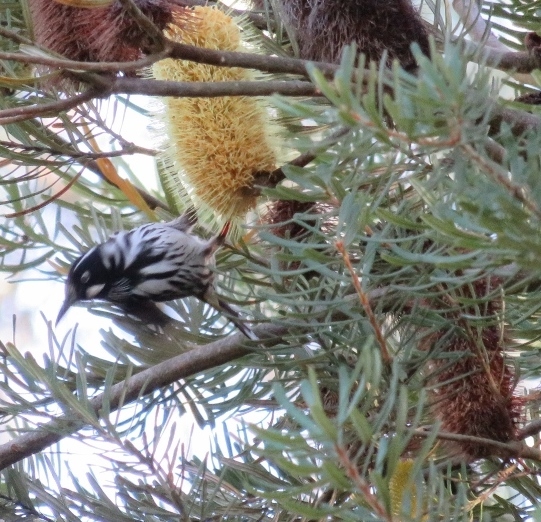 This bird is amongst the largest of the Australian honeyeaters. 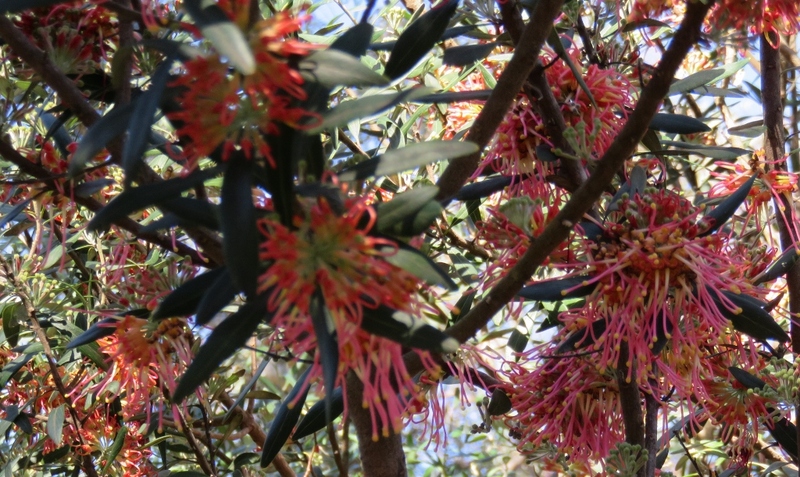 Despite the Eastern Spinebill’s loud call, he didn’t stand a hope and soon disappeared, and the Wattlebird took possession of the flowering Grevilleas, Camellias, and indeed, the whole garden.. 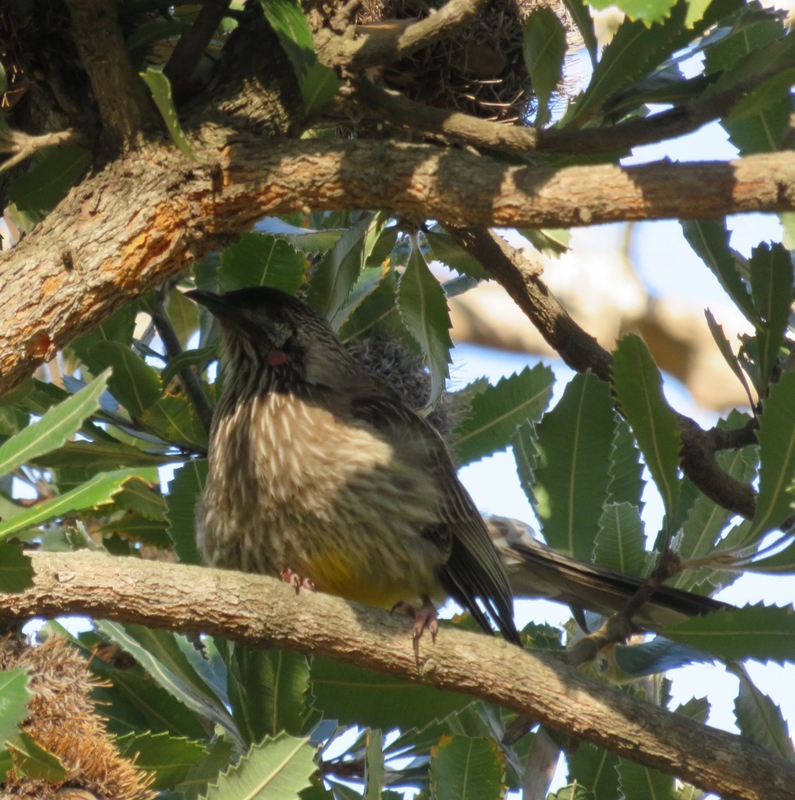 The Red Wattlebird is known to be very assertive, noisy, and tenacious. It is difficult to tell the male from female, but both are extremely territorial in spring. 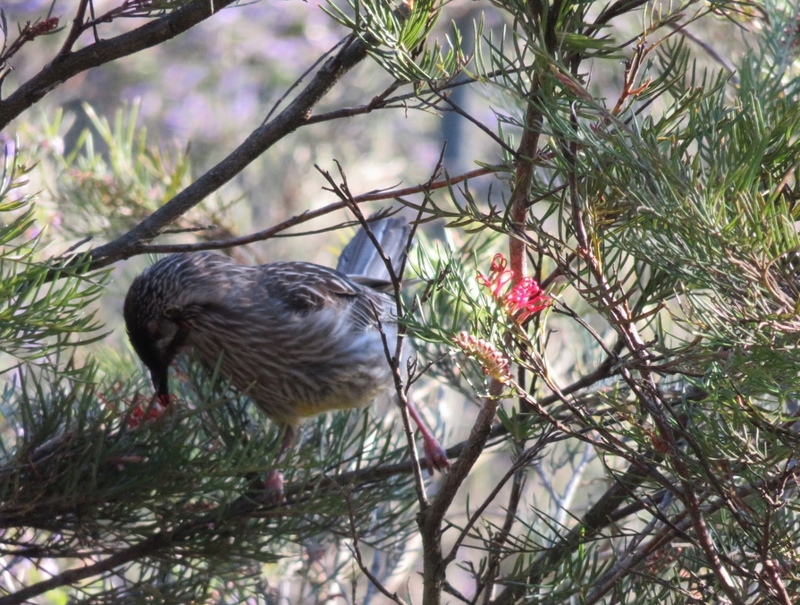 This year’s Red Wattlebird chased the sweetly twittering Silver-Eyes out of the plum tree, and the Crimson Rosellas out of the apricot tree. 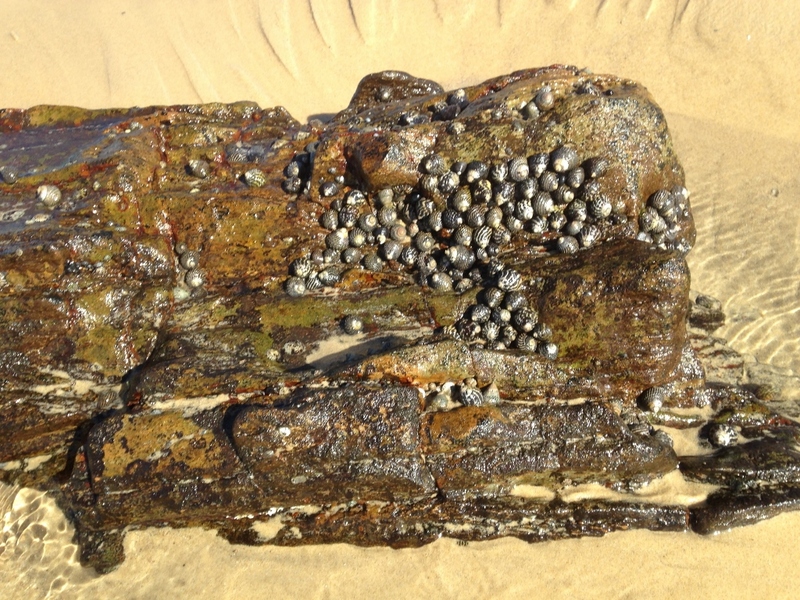 It’s not as if they are all searching for the same food. 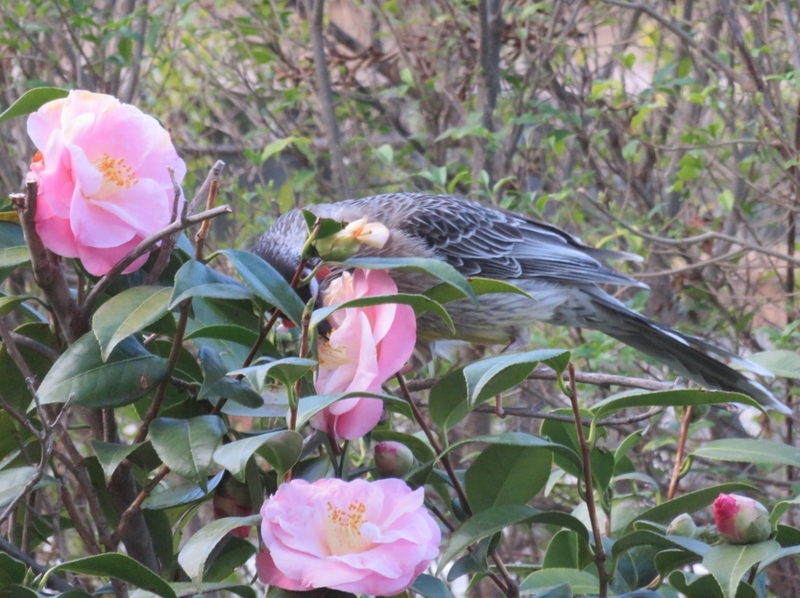 ..the Wattlebird mostly feeds on nectar, and occasionally eats insects, either in the foliage, or caught mid-air….but is not a dedicated worm eater like the Blackbird! 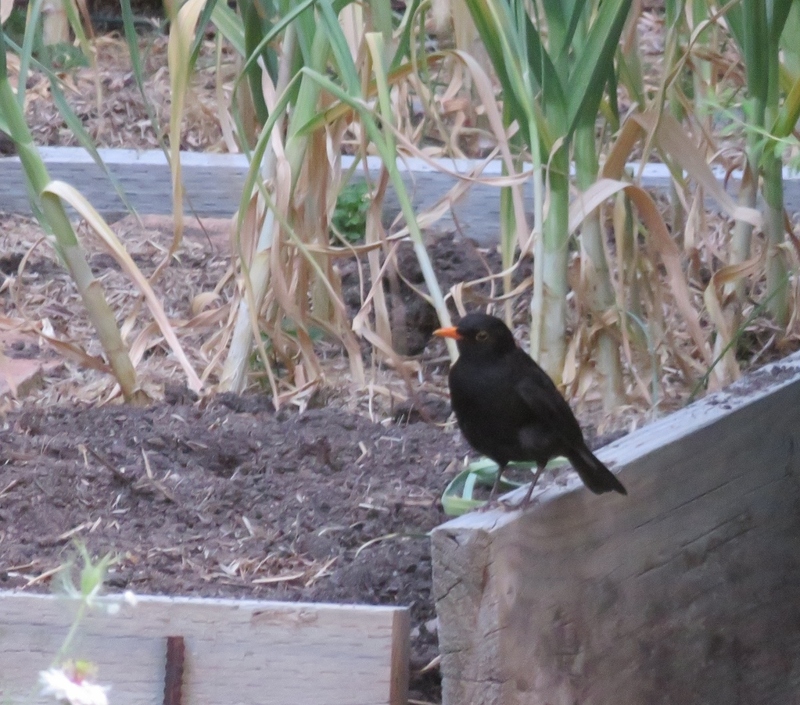 Our garden felt a bit like the Australian parliament last week, there was a sudden shift of power! 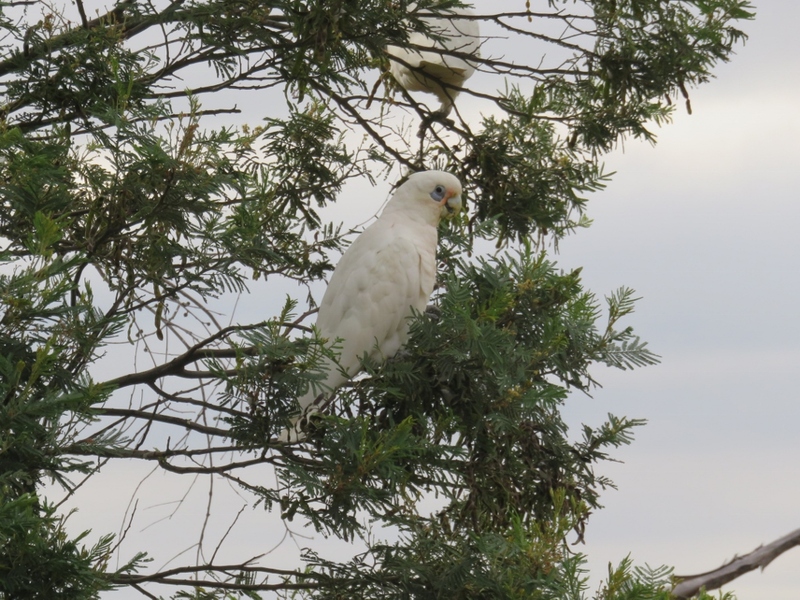 Yesterday, to Paul’s amazement, he saw the Red Wattlebird chasing a young Currawong…. David verse Goliath! 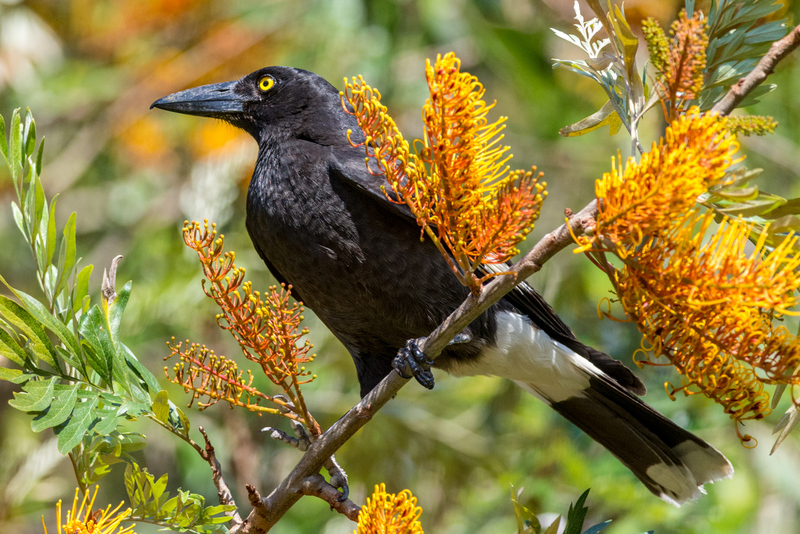 Currawongs are highly intelligent birds, with a distinctive and melodious call. 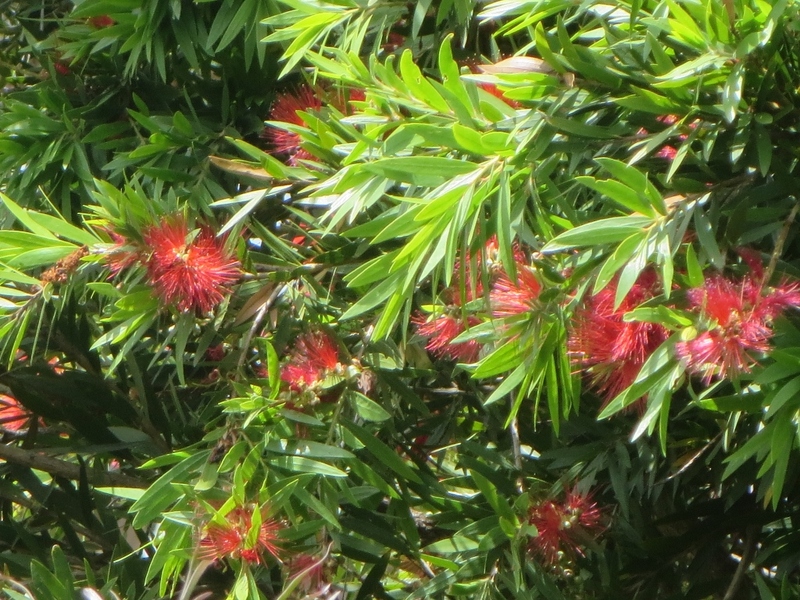 They eat fruits and berries as well as small vertebrates, and in spring they sometimes attack nests for bird’s eggs. 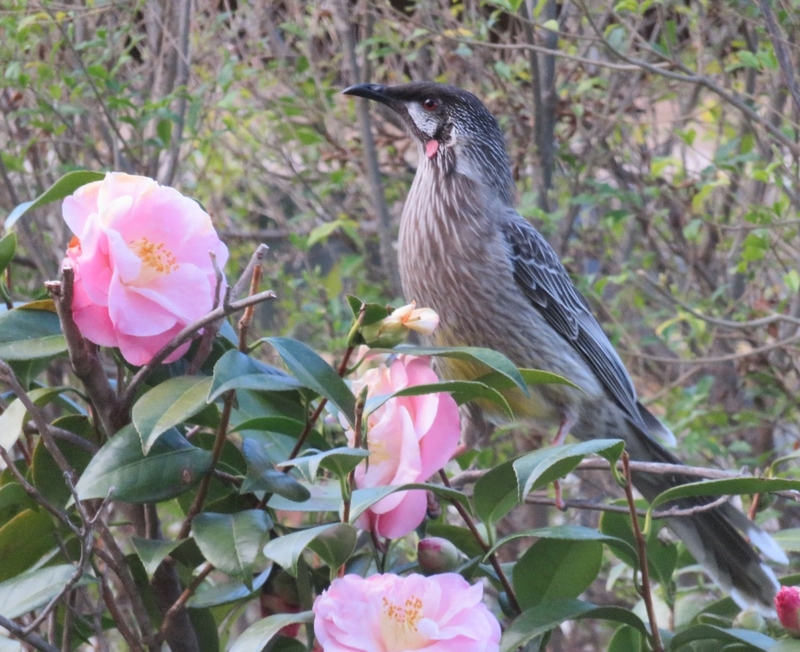 No wonder the Wattlebird has turned into BraveHeart! 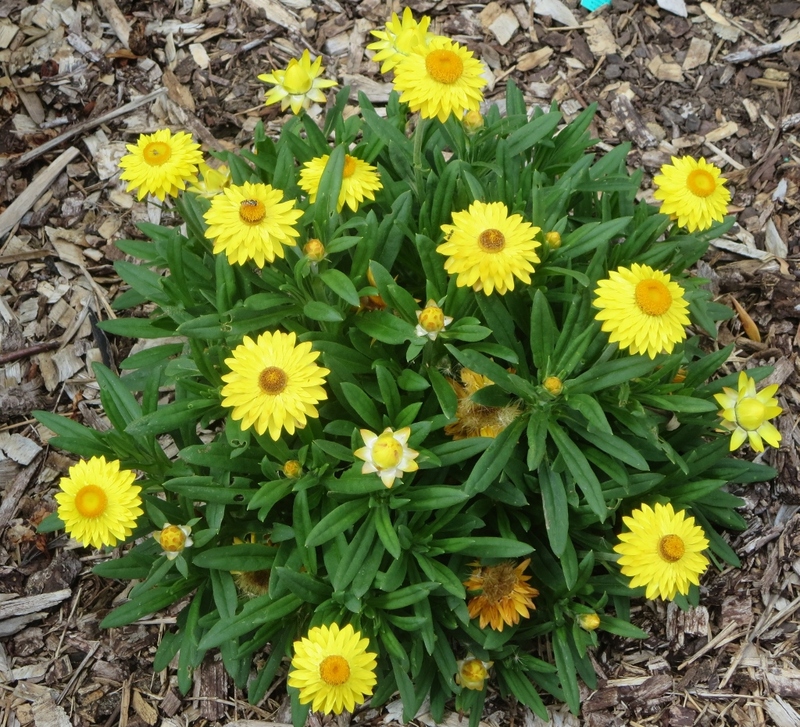 This spring we are choosing native plants to go into our newly cleared garden beds. 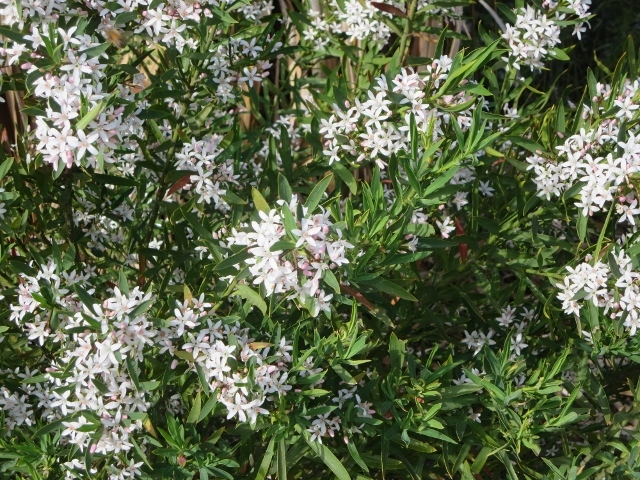 Canberra had half our annual rainfall this year, and surrounding areas have been declared drought affected, so we are looking for frost resistant, and drought tolerant plants. 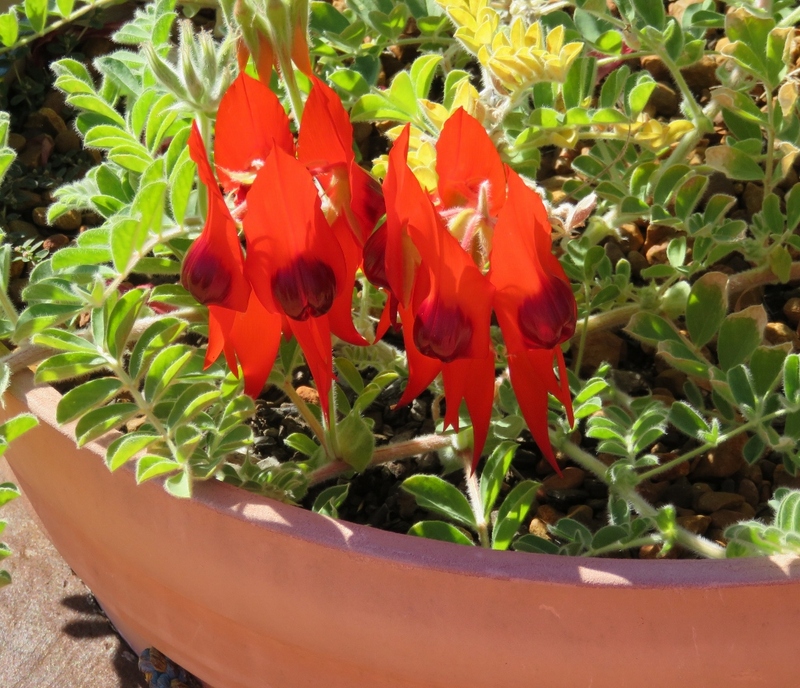 Correas, are very easy to grow, and the bell-shaped flowers attract nectar feeding birds throughout the year. 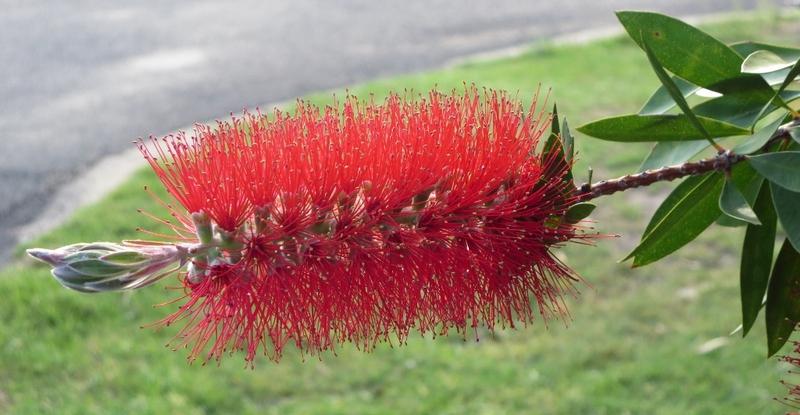 The Bottlebrush is a hardy rewarding shrub, we have some in the garden already, but they are so reliable, we’ll add more. 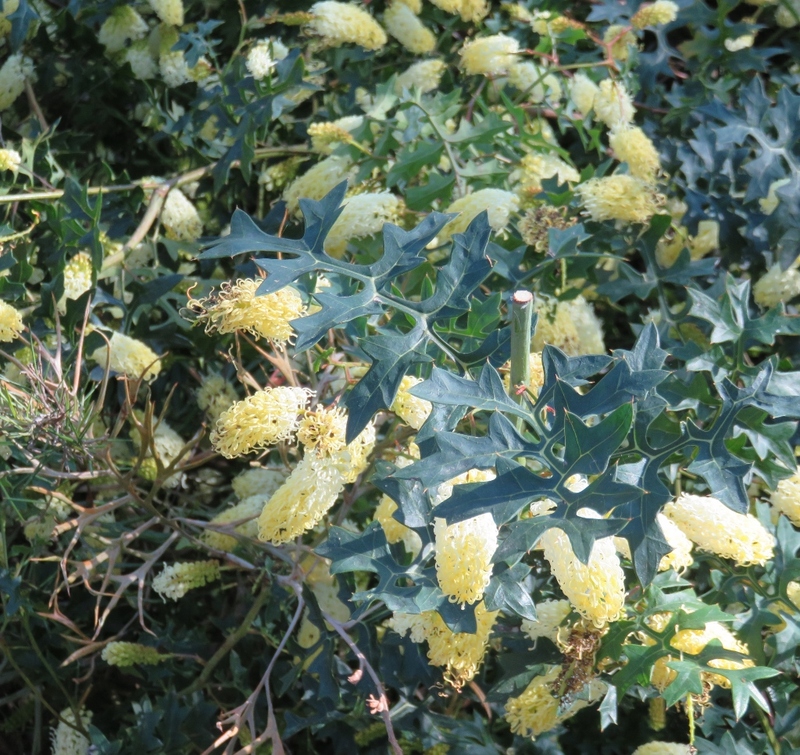 We had a Cootamundra Wattle Tree, beautiful while it lasted, but fairly short lived. We will plant another one. 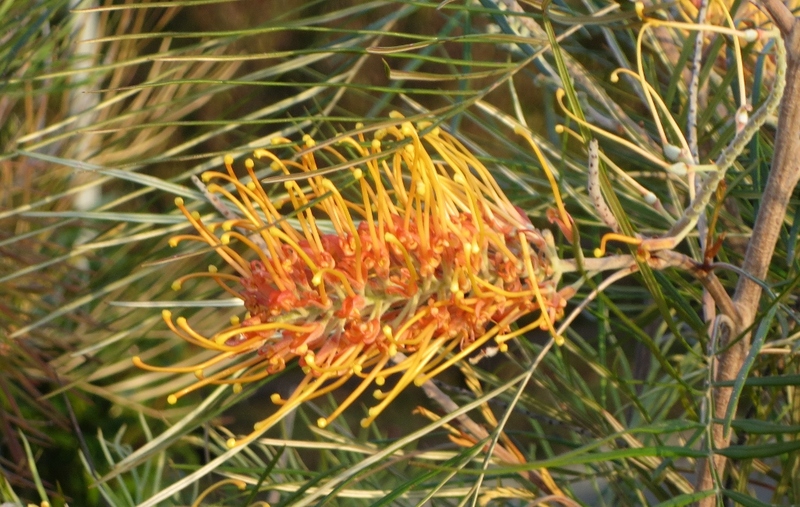 A New Holland honeyeater on a Banksia flower. 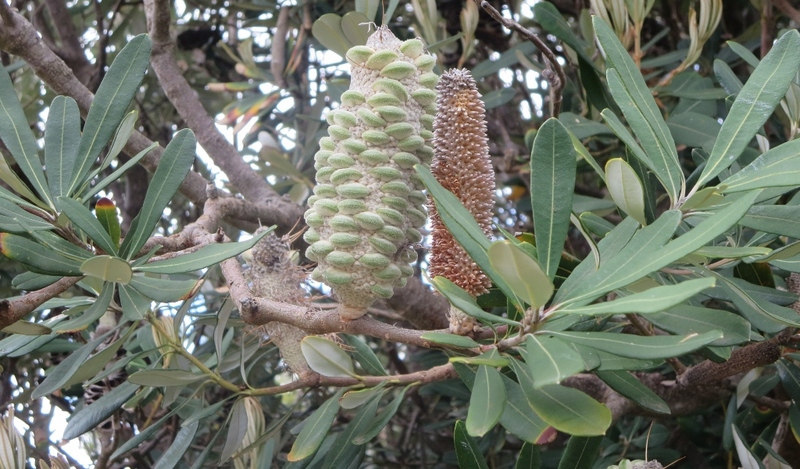 I have not succeeded in growing a Banksia in our garden despite their hardy ability to survive in drought, once established. 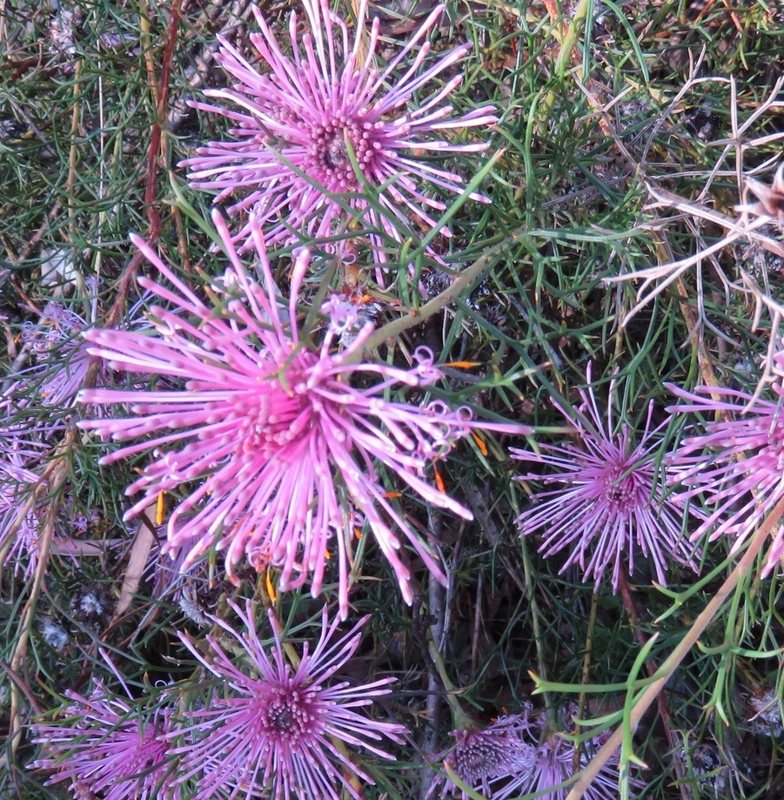 Who would not wish this lovely and unique flower in the garden, but I have only seen them thriving in the Australian Botanic Gardens, rather than gardens around Canberra. 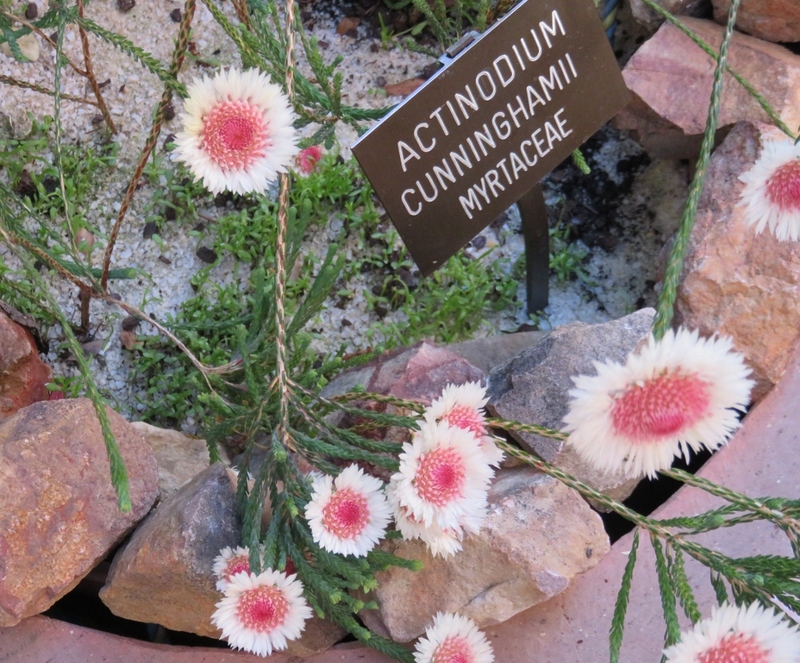 I’d love to know if anyone is growing them successfully in Canberra. 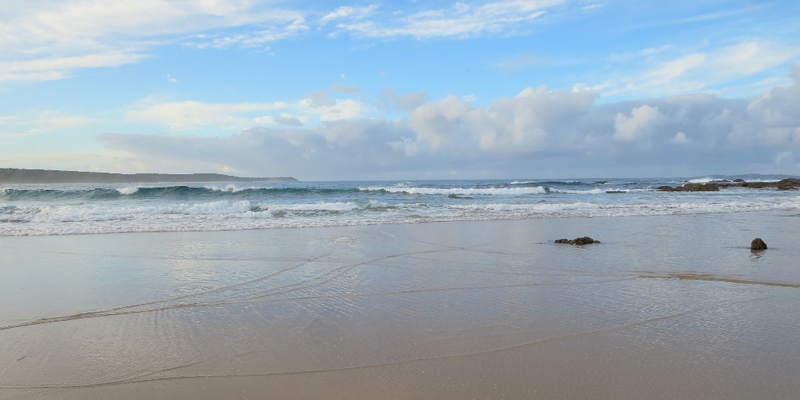 I hope you are enjoying your season, and your place in the world at this time of the year, and may the sun shine and the rain fall on all the drought affected areas, in Australia, and elsewhere. Many thanks to the photographers at Birdlife Australia, who generously allowed me to use their photos for the Eastern Spinebill and the Pied Currawong. This is a great organisation to support. Geraldine Mackey: Copyright, All Rights Reserved. 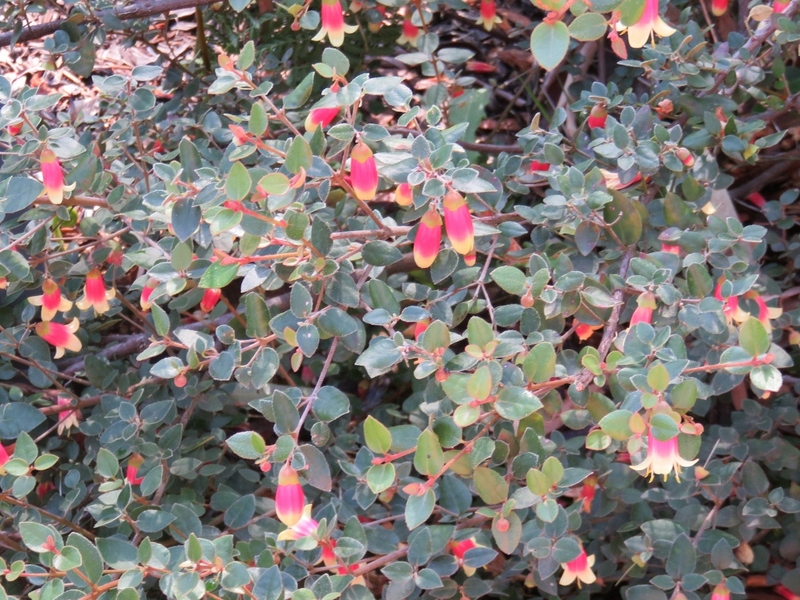 This entry was posted in Canberra's Suburban Gardens, Wildlife in the suburbs and tagged Banksias, Bottlebrushes, camellias, Grevilleas, Sturt Desert Pea Correas, The Eastern Spinebill, The Pied Currawong, The Red Wattlebird, Wattle flowers on September 15, 2018 by germac4. 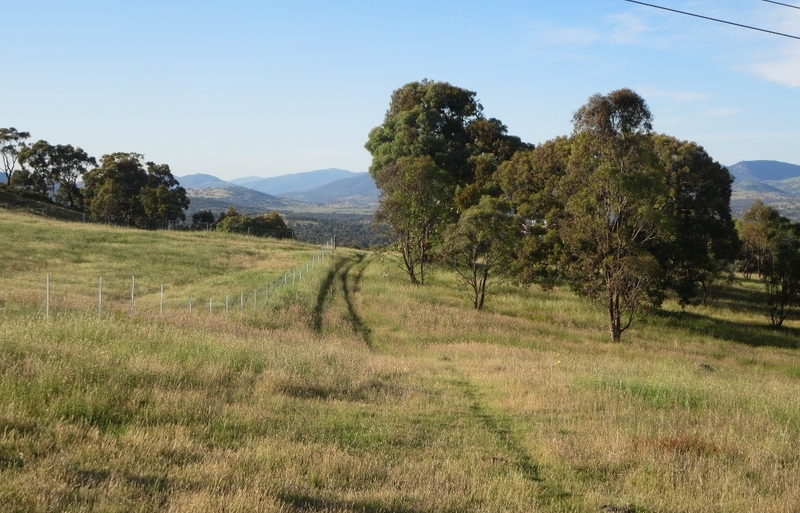 Mount Taylor, a summer walk..
Summer is coming slowly to the Brindabella Mountains, a lovely blue and green tinge lingering from spring. This is the view of the mountains from our street. 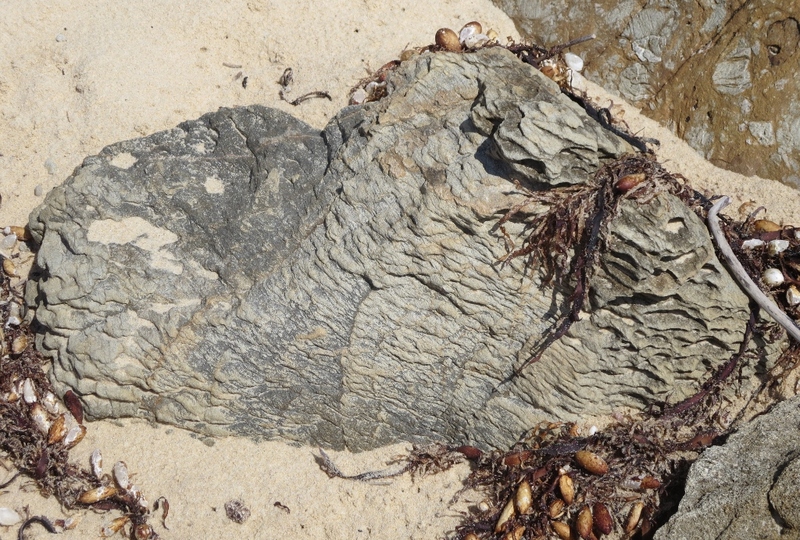 This region is Ngunnawal country, and it was an important meeting place and significant to many Aboriginal groups. The mountains and hills were used as markers and were excellent vantage points for keeping an eye on enemy clans, and signalling friendly clans. 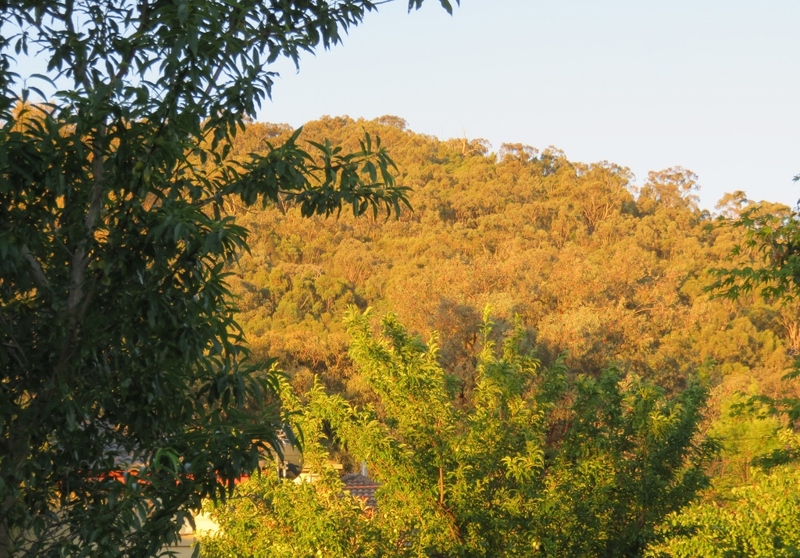 This is a glimpse of Mt Taylor from our back garden….a backdrop behind our almond and plum trees. 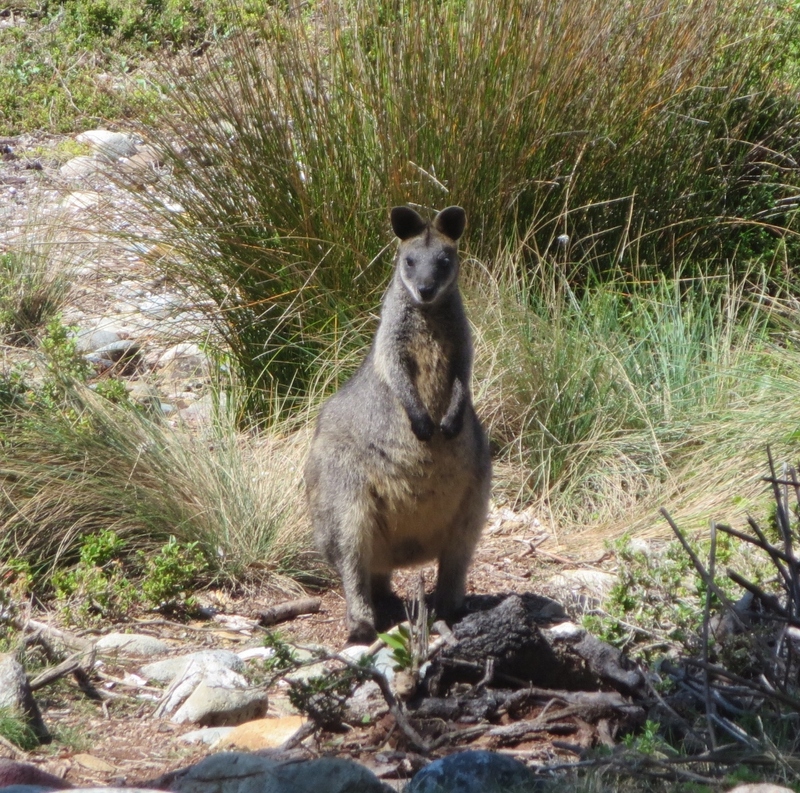 Last month, the end of spring, we enjoyed an early morning walk, up Mt Taylor. 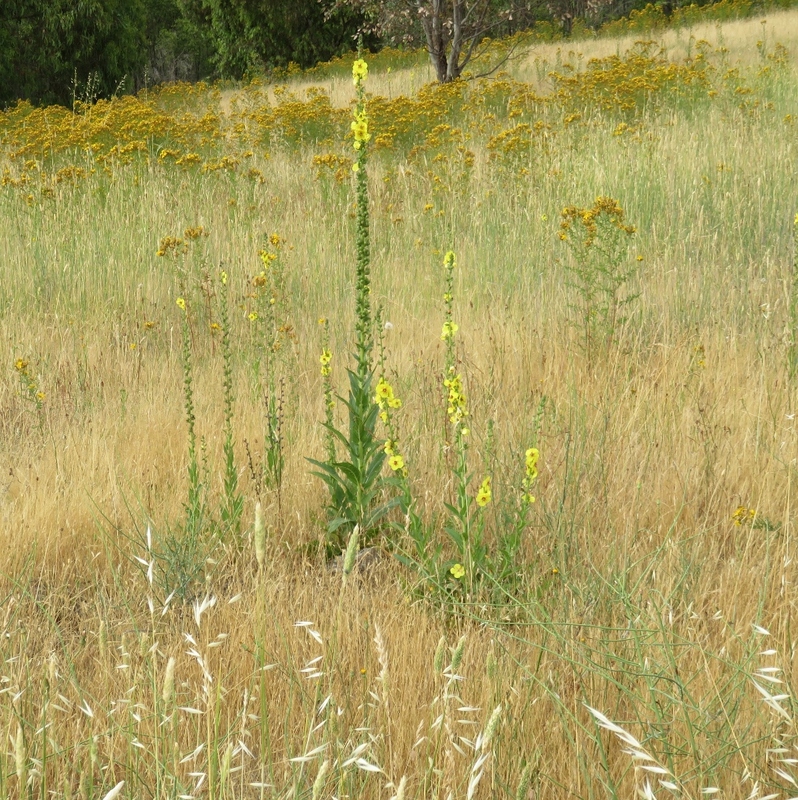 Amongst the grasses there were some wild flowers. 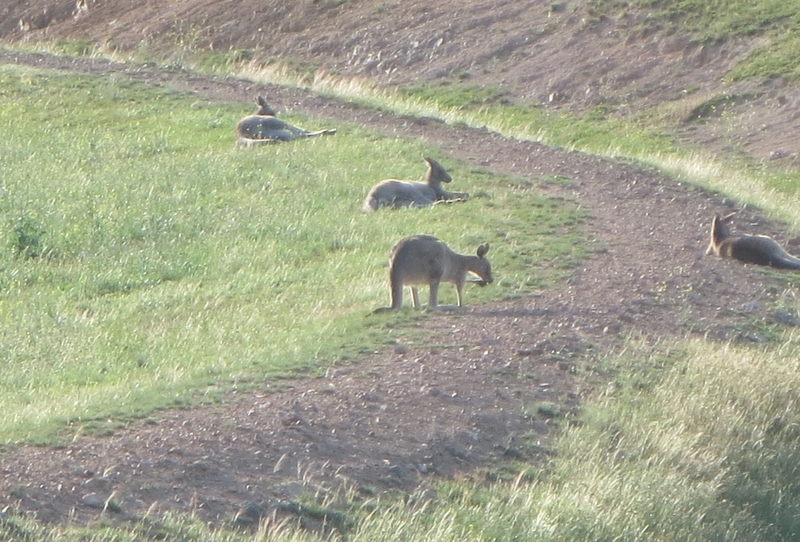 The kangaroos are alert and looking for greener grasses.. 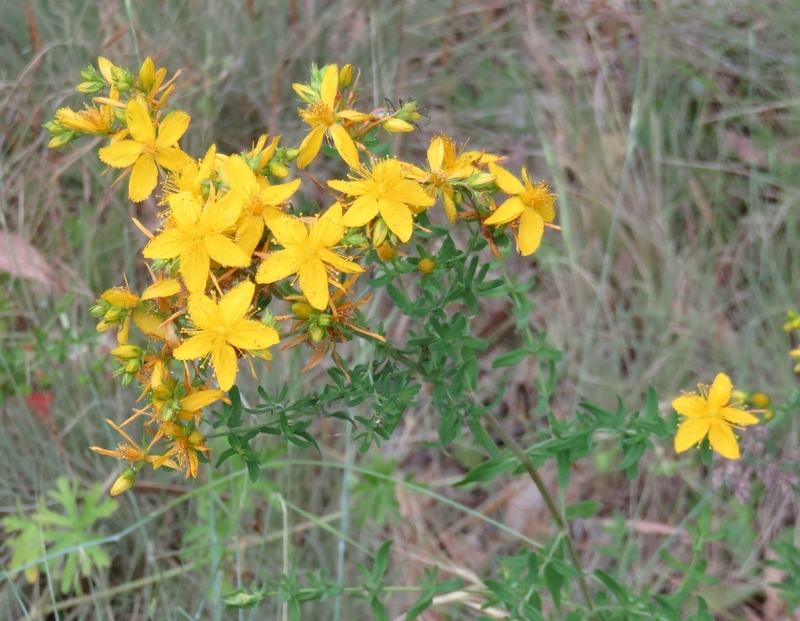 Some wild flowers are still blooming…the grasses are drying off.. 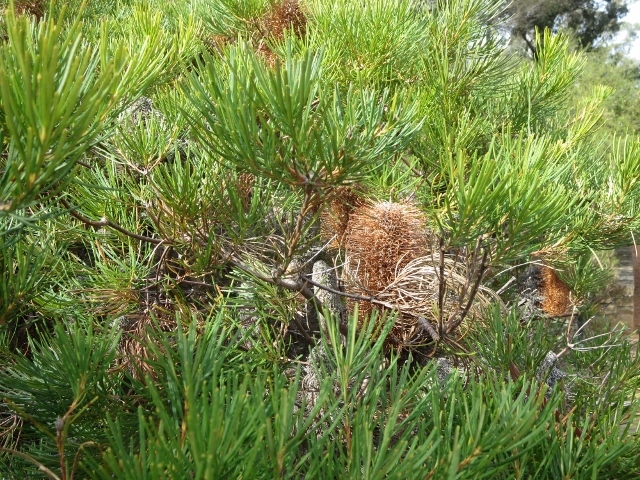 The natural bush colours of summer; grey, yellow and brown are everywhere to be seen. 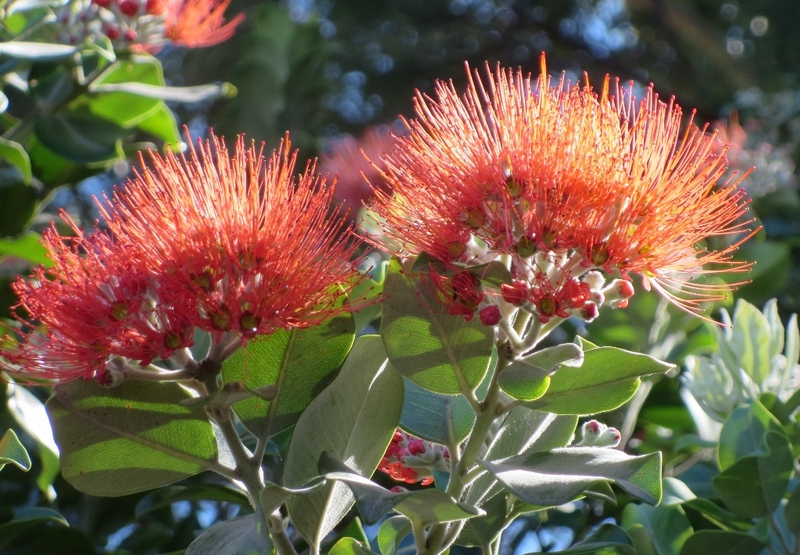 What a joy to see these flowering Eucalyptus trees…the flowers and supple branches are often used in Christmas wreaths, and always remind me of summer holidays.. 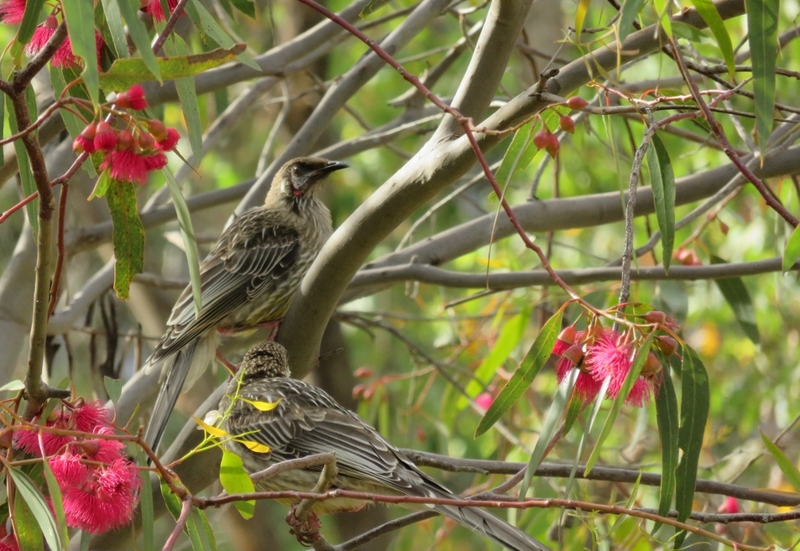 Here are two Wattle birds…like many Australian wild birds…quite bossy! 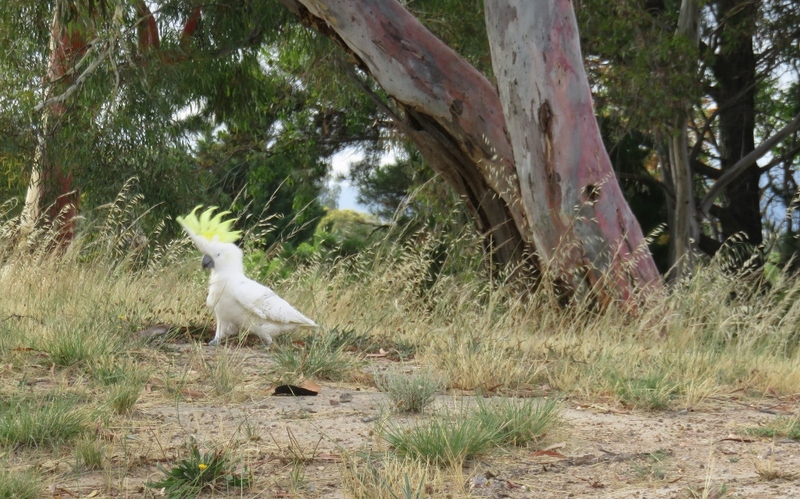 I wonder if that magnificent yellow crest increases self esteem for Cockatoos? As we walk back home I can’t help taking photos of two lovely flowers, one growing almost wild in a corner of someone’s garden. 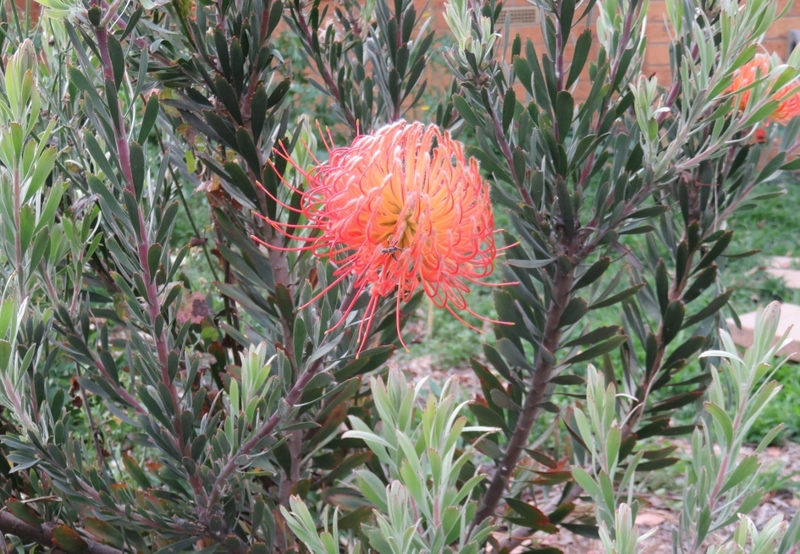 I’m not sure of its name, but one of the Protea family I think. And back home to our garden. Paul has spent a few heavy lifting days putting mulch down all over the garden, to keep the plants cool for summer. 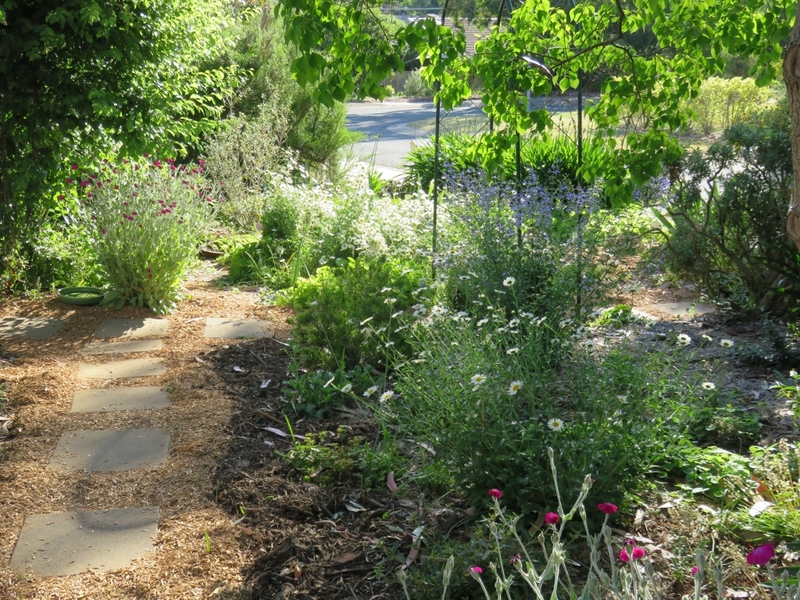 Here in the front garden we are planting for birds and bees…salvias, daisies, Grevilleas, and the lovely Chinese Tallow tree. May you enjoy your green spaces, where ever you are in the world, and if you are in the depth of a northern hemisphere winter, then I hope you are planning for your spring! 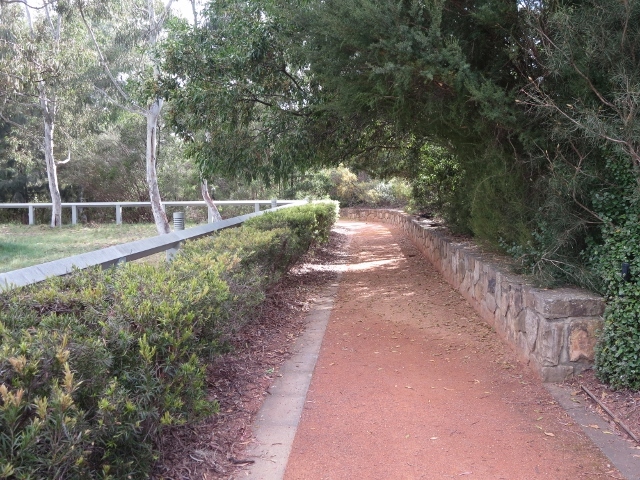 This entry was posted in Canberra's Public Gardens, Canberra's Suburban Gardens, Wildlife in the suburbs and tagged Bottlebrush, Canberra, Chinese Tallow tree, cockatoo, Corella, daisies, Eucalyptus trees, gardens, Golden Everlasting, green belt, Grevilleas, kangaroos, magpie, Mount Taylor, Ngunnawal, Noisy Friar bird, protea, salvias, spring, Summer Brindabella Mountains, Walter Burley Griffin, Wattle birds on December 12, 2016 by germac4. 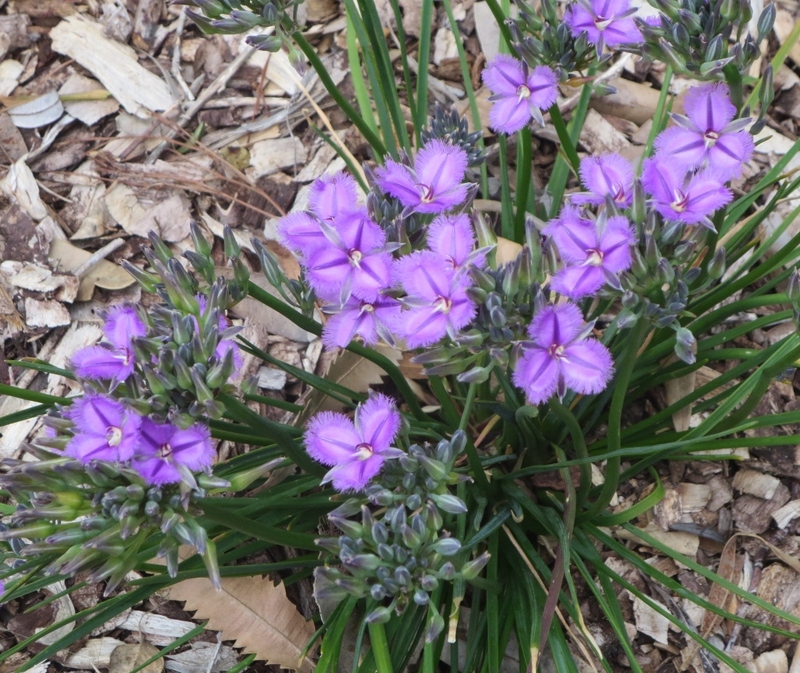 Canberra has had very good winter rainfall, and now, at last, all the plants have sprung into life. 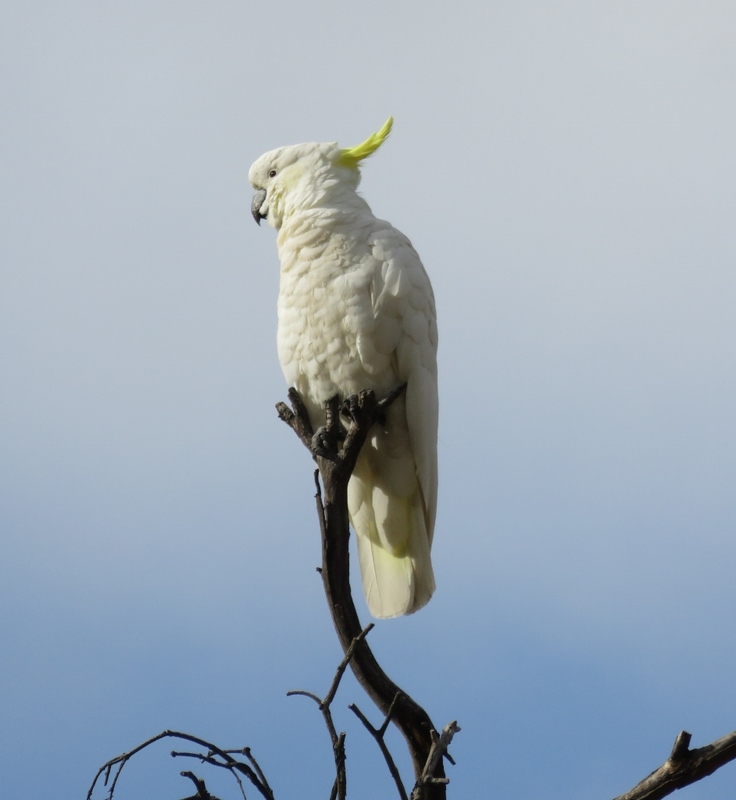 Recently we took a guided tour of the Gardens, called ”Breakfast with the birds”. It was absolute magic to be able to stroll around the grounds of the Botanical Gardens in the warm early morning sunlight, before the gates were open to the public. This was followed by a delicious breakfast in the café. A great way to start the day. 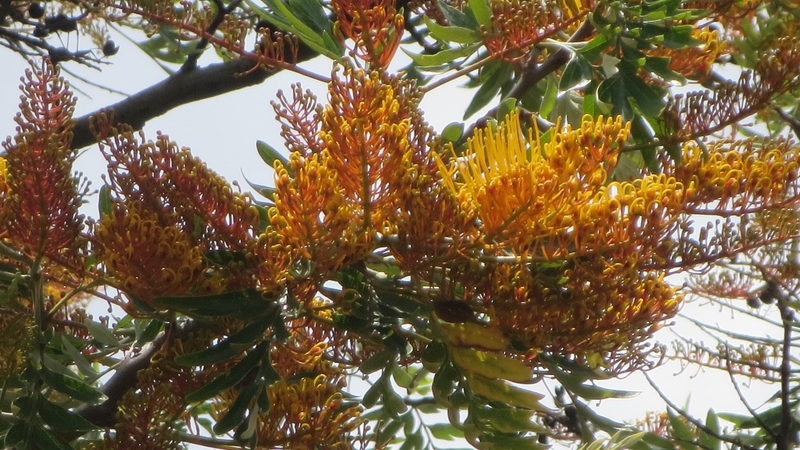 Our guide said Wattle Birds have to check each individual flower in the Grevilleas and usually only find some nectar in about one in ten flowers. No wonder they are such busy birds. In spring they whiz about our gardens like streaks of light…my neighbour says it is like being in a Star Wars movie sometimes. 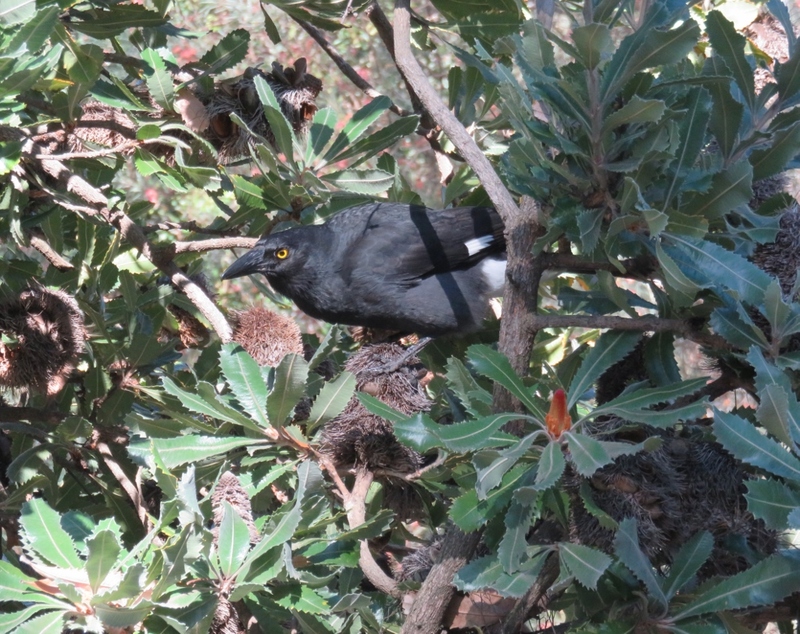 This Wattle Bird has a nest just above her head in the Banksia bush. 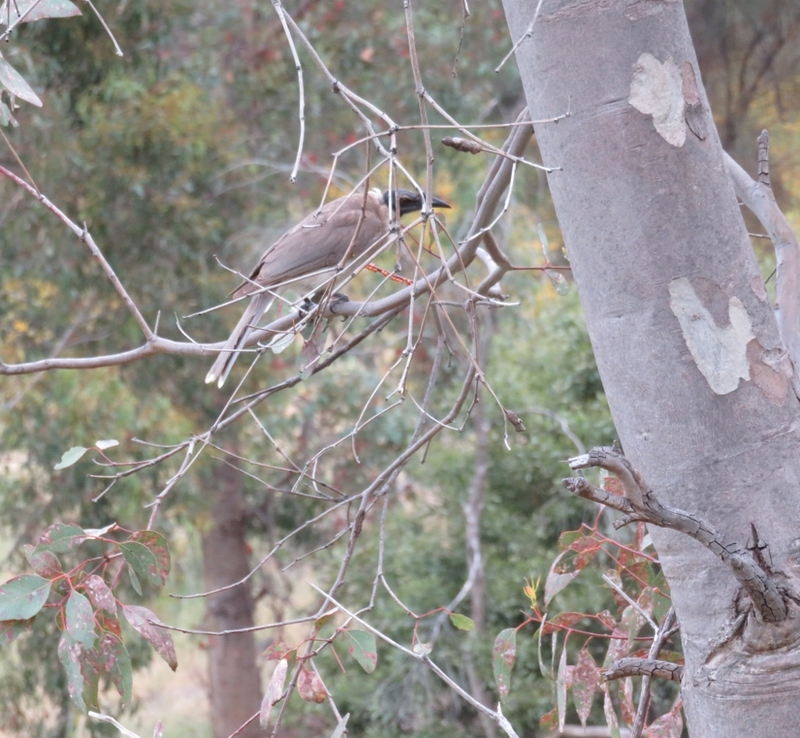 The ever alert Currawong is in the same bush…waiting.. 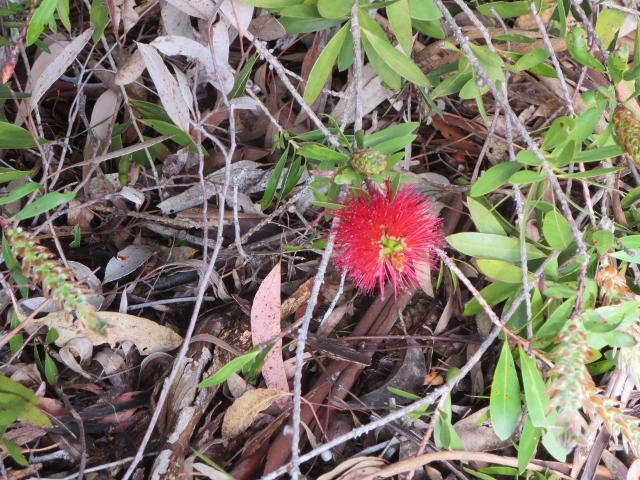 I love looking out for birds, but the colourful native plants were the scene stealers on this day.. 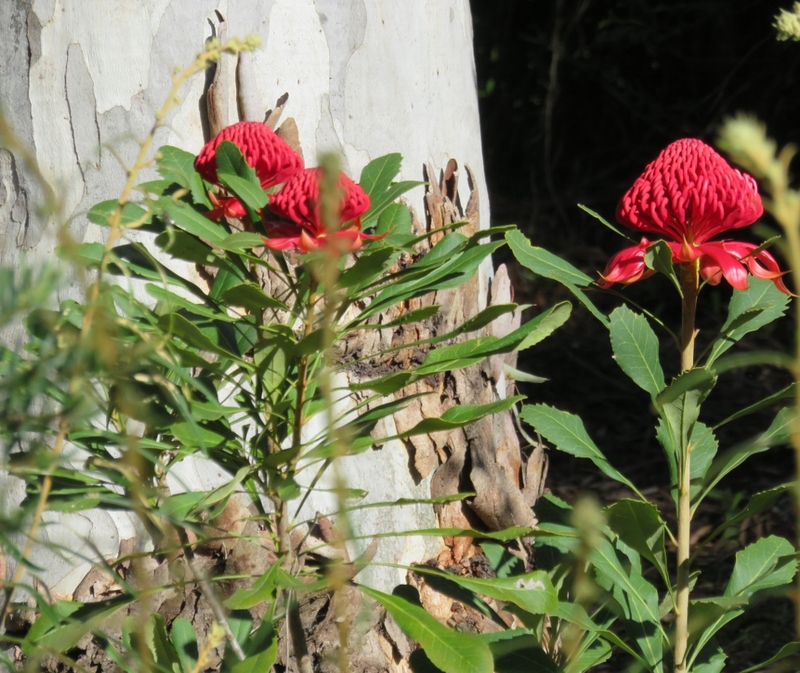 The Proteas (Waratahs) look wonderful alongside the ghostly white eucalyptus tree. 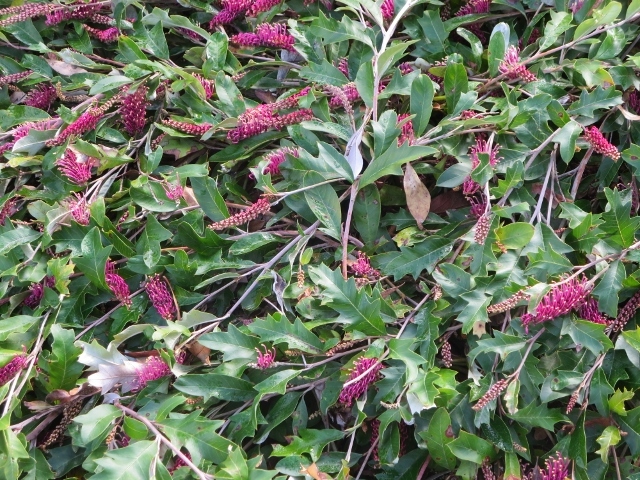 And here are more Grevilleas and other spring flowers. 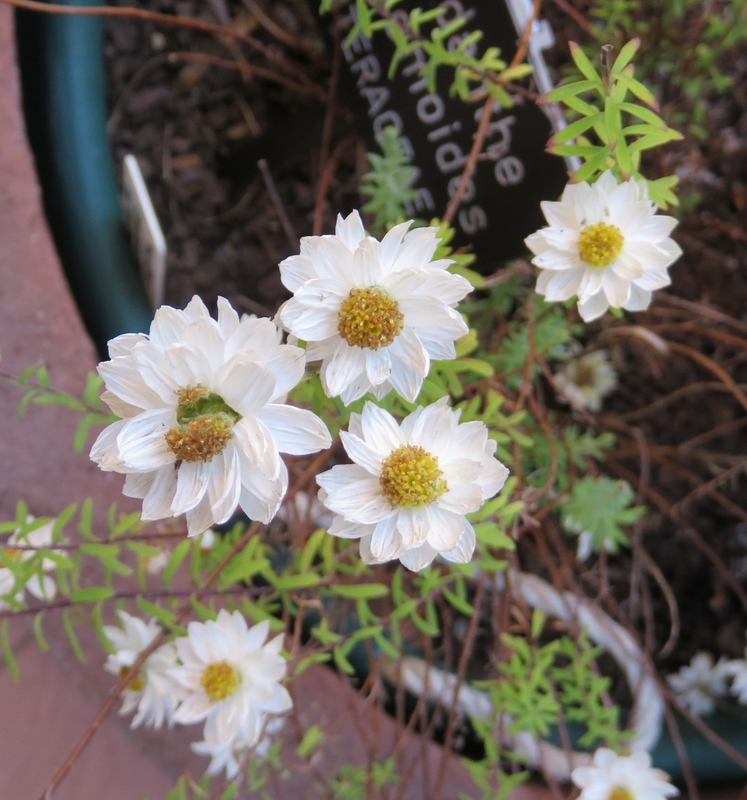 I’d love to know if you have a favourite amongst your own plants. 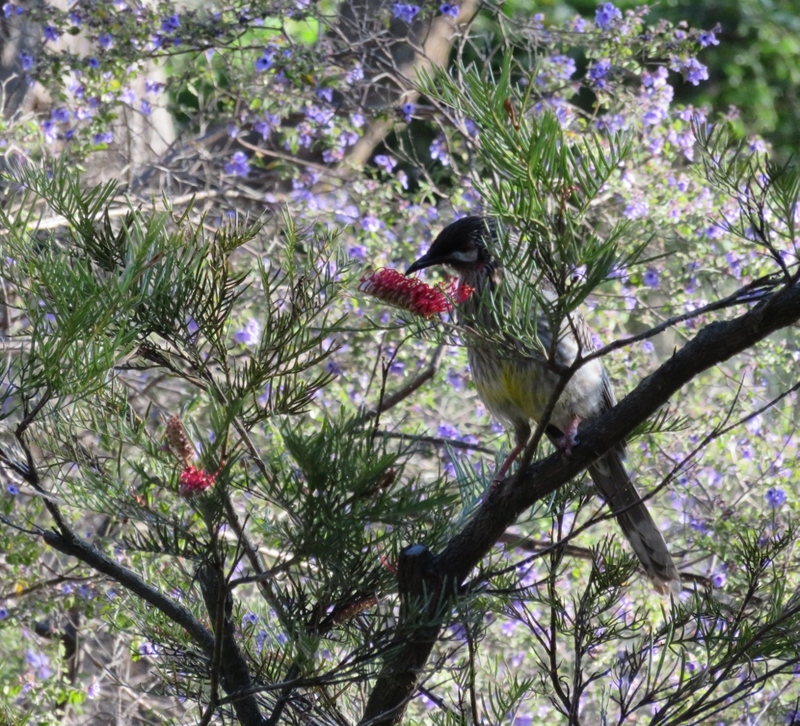 This entry was posted in Canberra's Public Gardens, My Place, Wildlife in the suburbs and tagged ''breakfast with the birds'', birds, Canberra, currawongs, Eastern Spinebill, Grevilleas, National Botanic Gardens, Proteas, spring flowers, Wattle birds on October 17, 2016 by germac4. 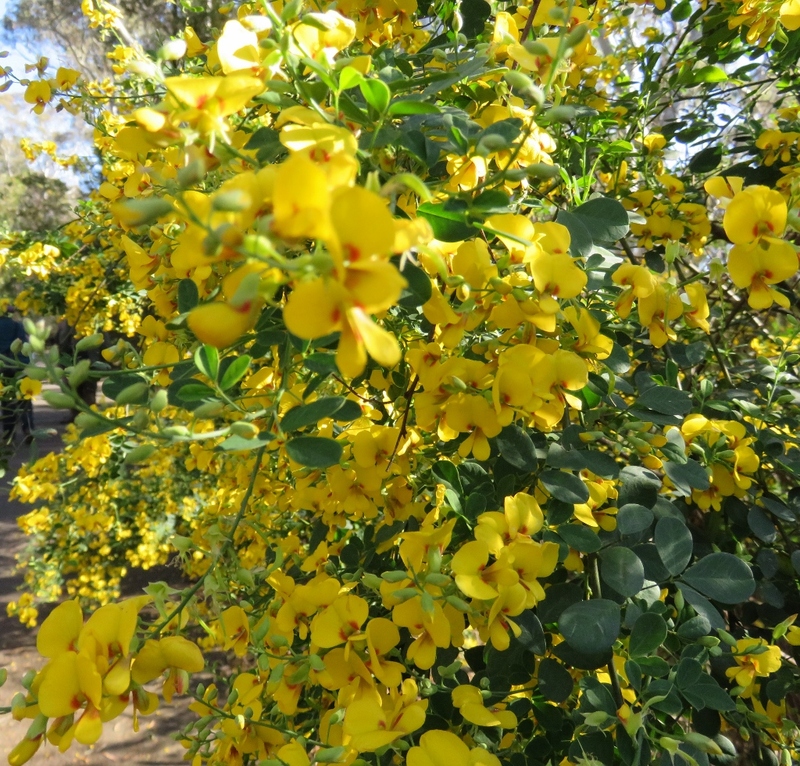 Beyond the city, the bush garden calls…. 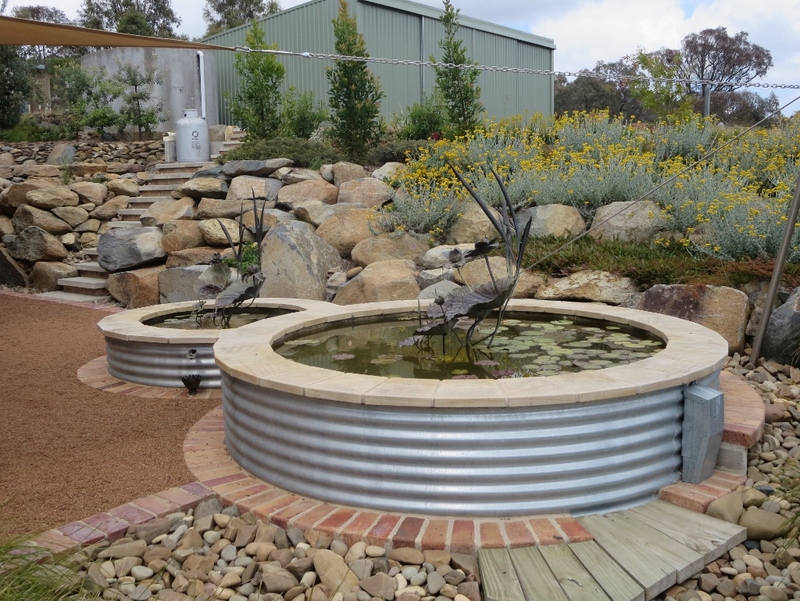 Peter and Lyn have created a water wise, bush-style garden within 40 minutes of the city centre of Canberra. It has been a work in progress since 1981, and shows incredible dedication and talent. 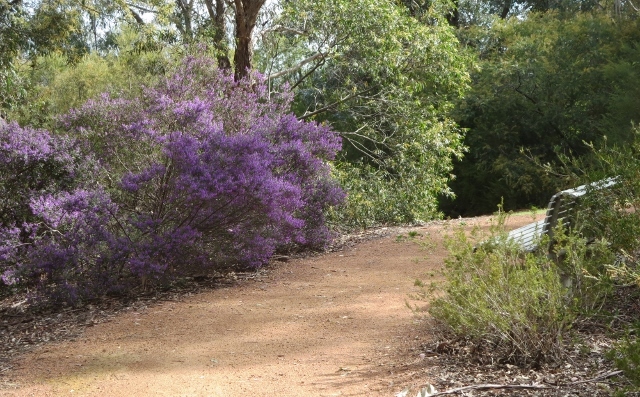 As they had chosen to live out of town, Peter and Lyn wanted the garden to blend in with the surrounding bushland. All the dry stone retaining walls are made of excavated rock from the house site. 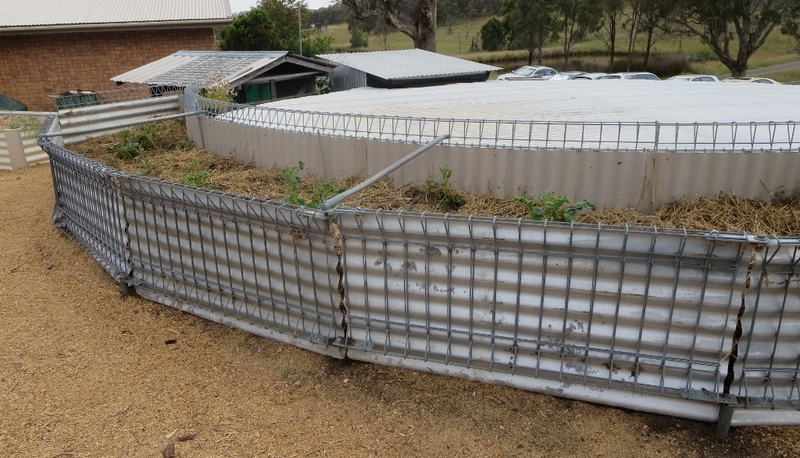 Peter has constructed and built the walls, steps and structures…in fact….everything! 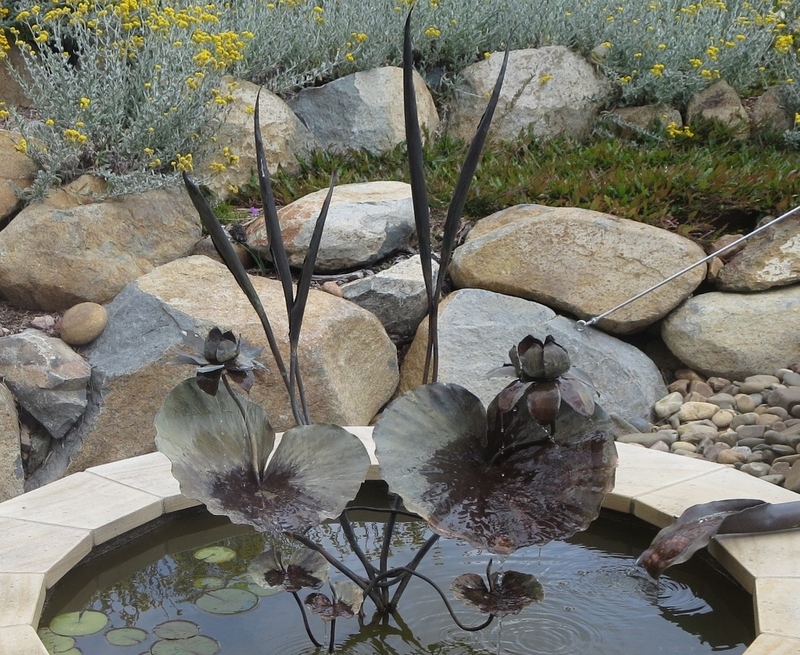 The copper sculptures in the garden are designed by Annie Storey, and the corrugated water tanks and sandstone set them off well. 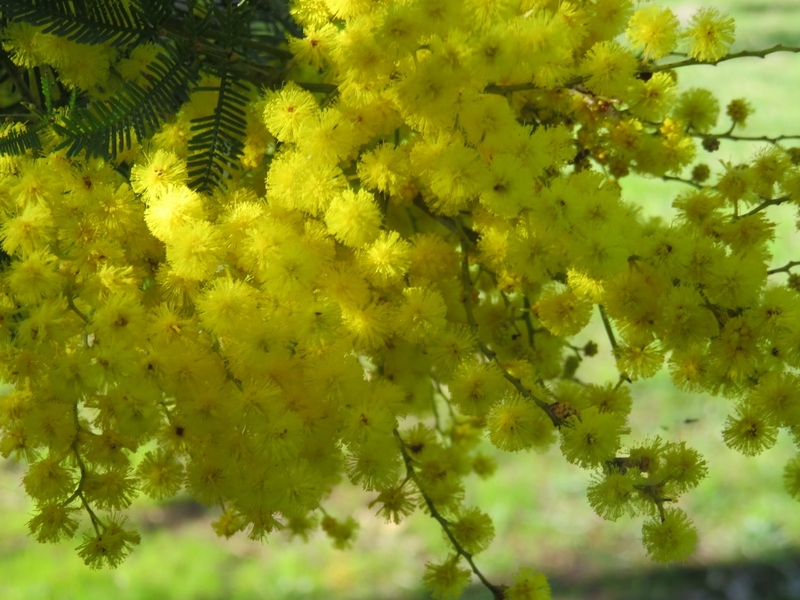 Lovely to see the yellow flowering Acacia cognata spreading across the rocks. 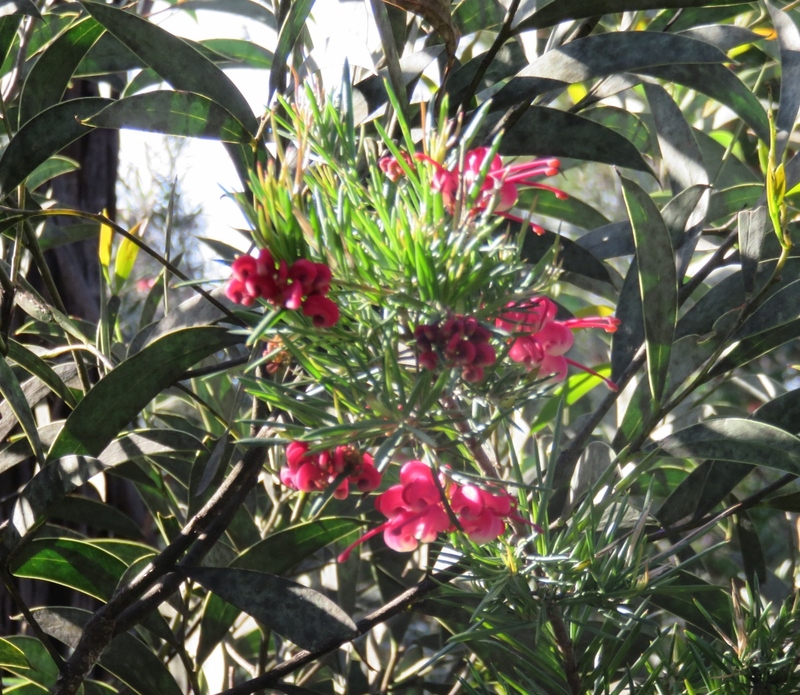 There are some camellias, and other exotics tucked away in the front garden, but we are here in early December, when the real heat starts, so we are looking at the predominantly native parts of the garden. 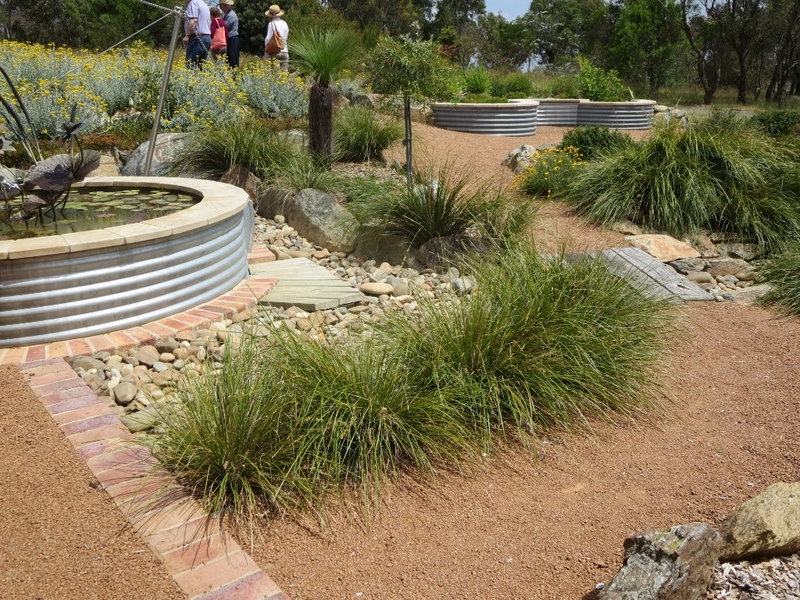 Beyond the water features, Peter has used more corrugated iron and sandstone as borders for garden beds. 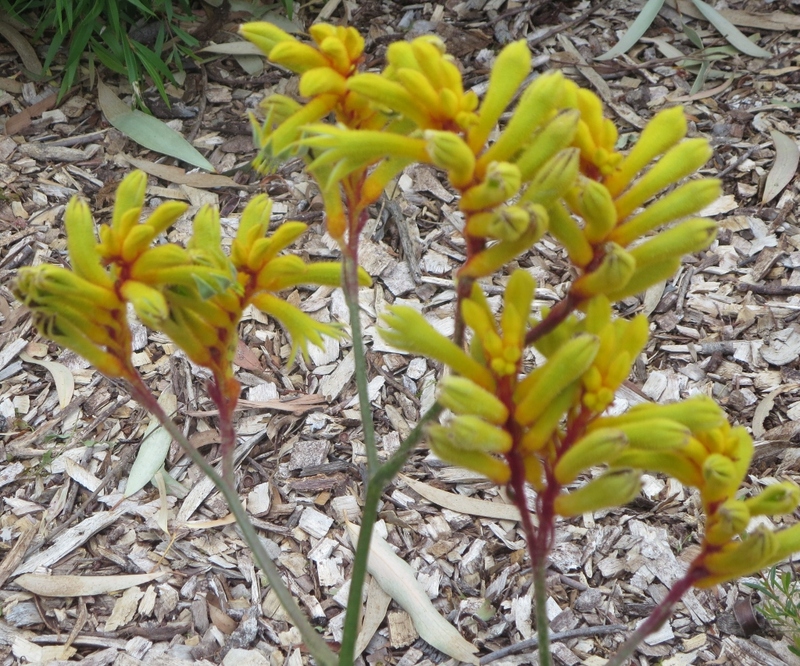 kangaroo paw, golden correa, forbs, grasses, mountain devil and other local indigenous plants. 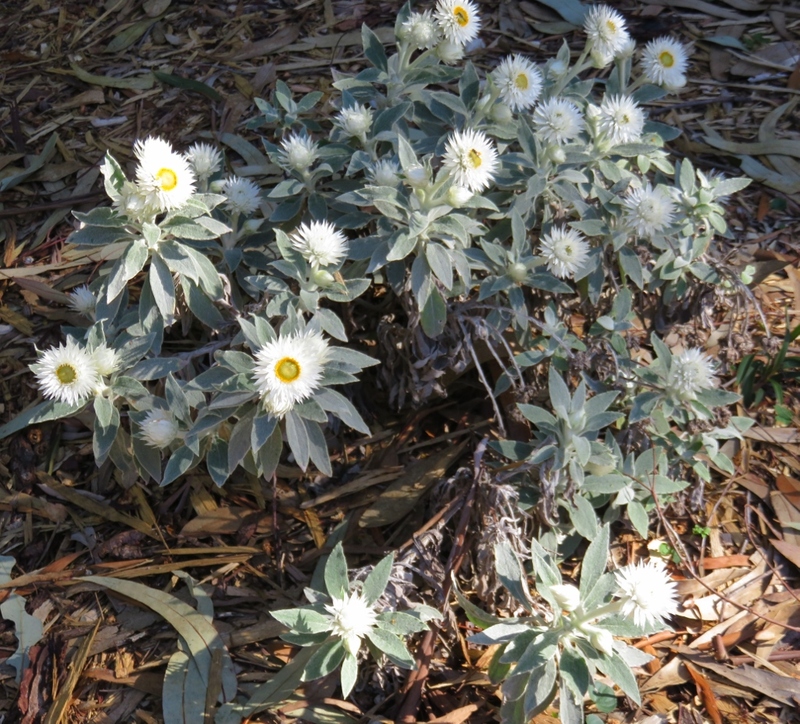 Along the side walk are Waratahs, a flannel flower and Banksias. 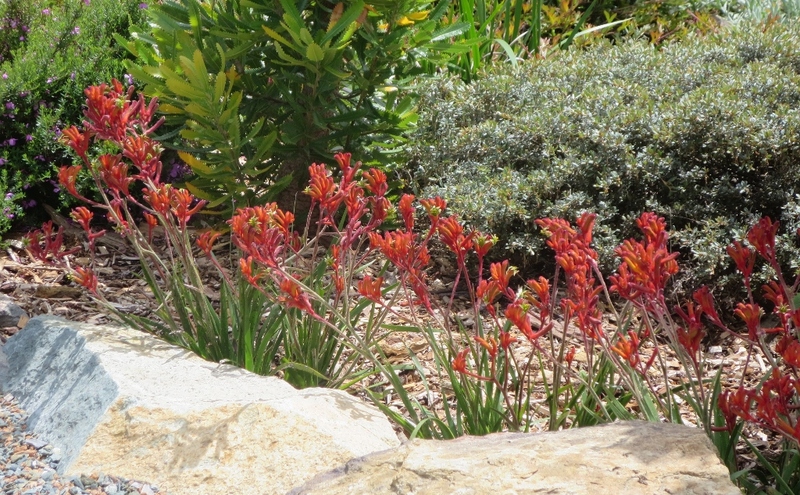 The kangaroo paws used to be in pots but are now doing well in the garden. The vegetable garden and orchard have become Lyn’s domain since she retired. The orchard provides them with lemons, nectarines, mandarins, cherries, pears, and the surrounding bushes are raspberries and blueberries and grapes. 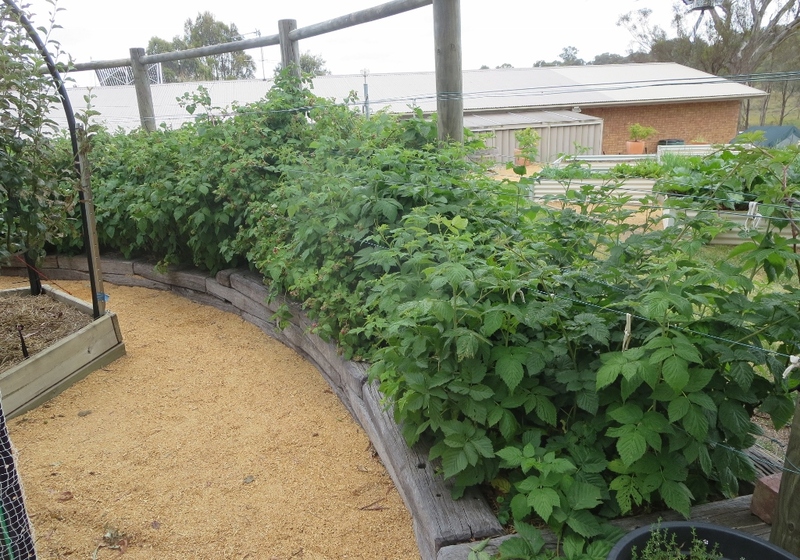 Here are the vegetable beds with strawberries, peas, beans, capsicum, eggplants, herbs, cucumber, corn and carrots and asparagus…all on four bed rotation. Now that is organisation for you! 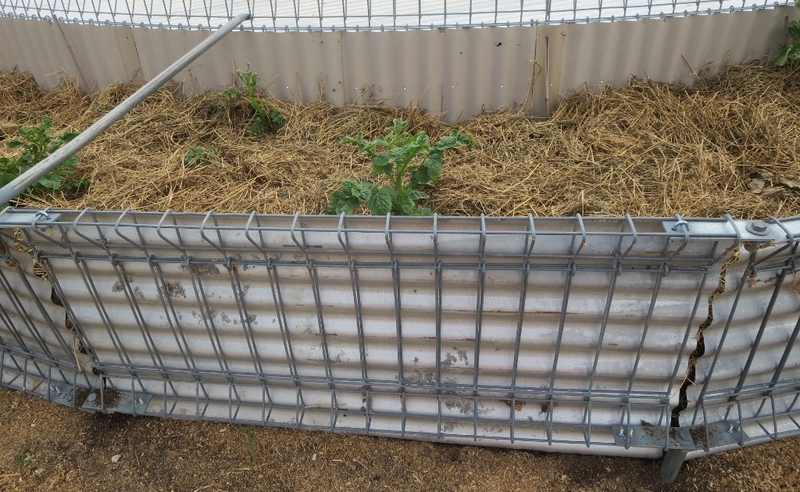 The potato bed has been designed to allow Lyn to open part of the fencing and harvest potatoes without disturbing the plant. 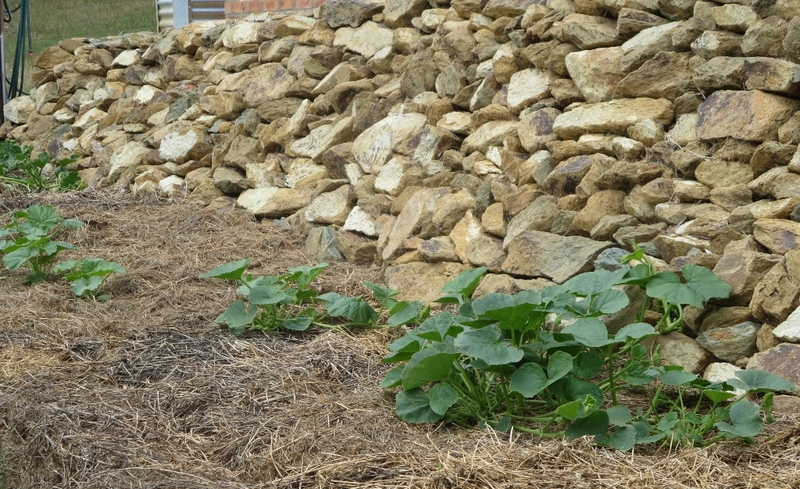 There is a bed for rockmelons, pumpkins and zucchinis at the bottom of the dry stone retaining wall. 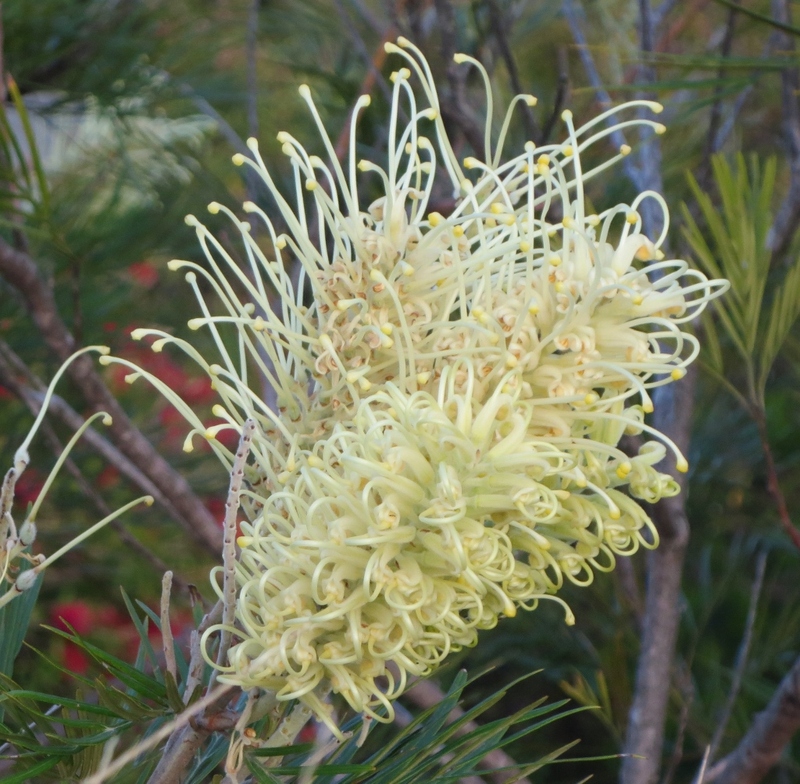 As we walk around the garden and back to the car, we see this glorious Grevillea with flowers like candles shining in the sun…. and it’s beginning to look a lot like Christmas! 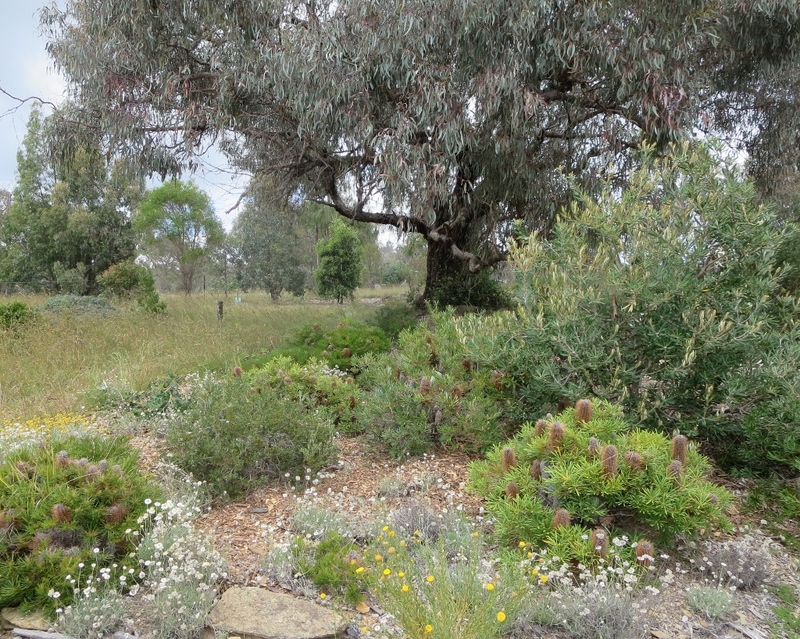 Thanks to Lyn and Peter for sharing this wonderful bush setting which is their home and garden. 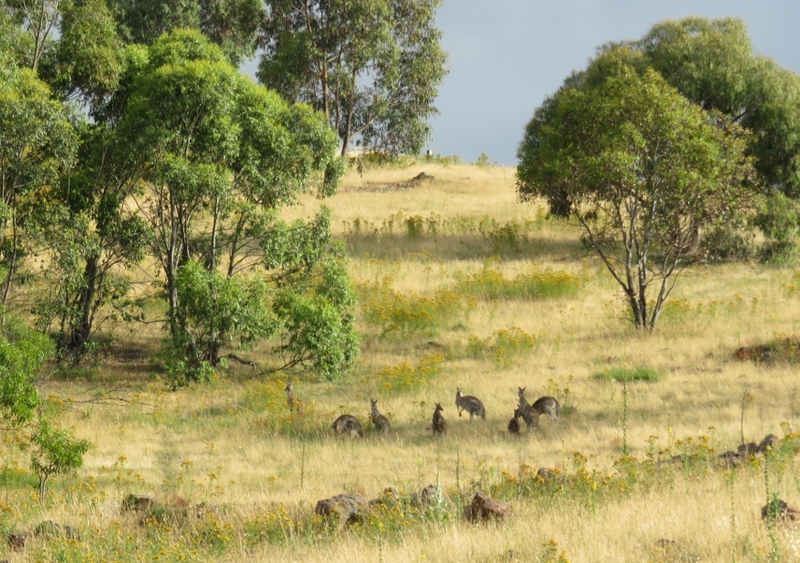 This entry was posted in Canberra's Suburban Gardens and tagged Acacia cognata, and sandstone seats, corrugated water tanks, dry creek bed, dry stone walls, grass tree, Grevilleas, Kangaroo Paws, water wise on December 17, 2015 by germac4. 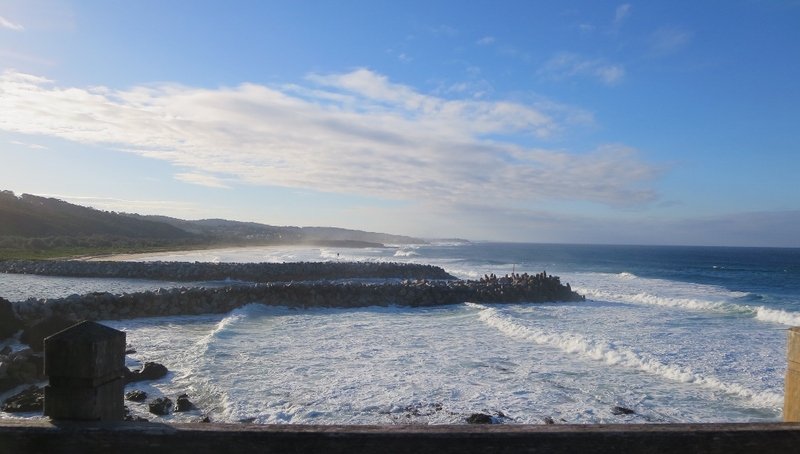 Later, we had coffee looking out over the Narooma breakwater…. 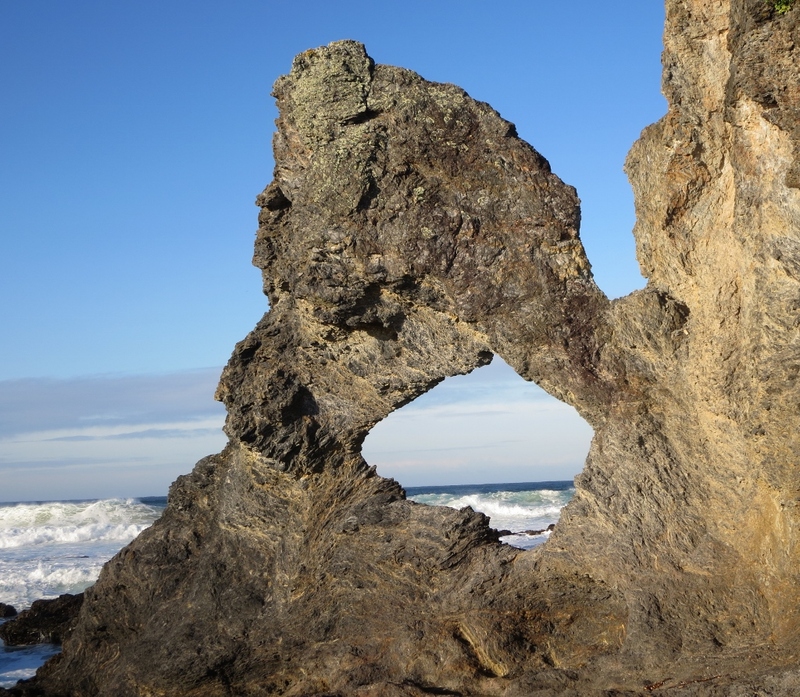 then we walked along the craggy path to the headlands… I wished I’d had this photo while I was still teaching.. 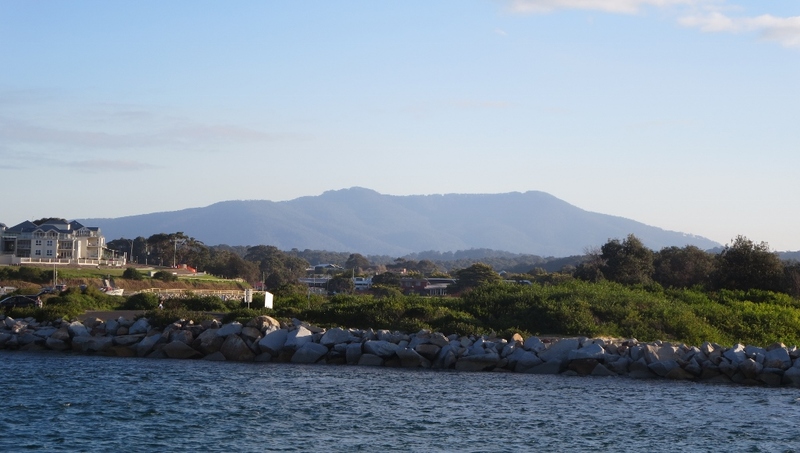 Turning back from the headlands, is Narooma with Gulaga (Mt Dromedary) in the background. 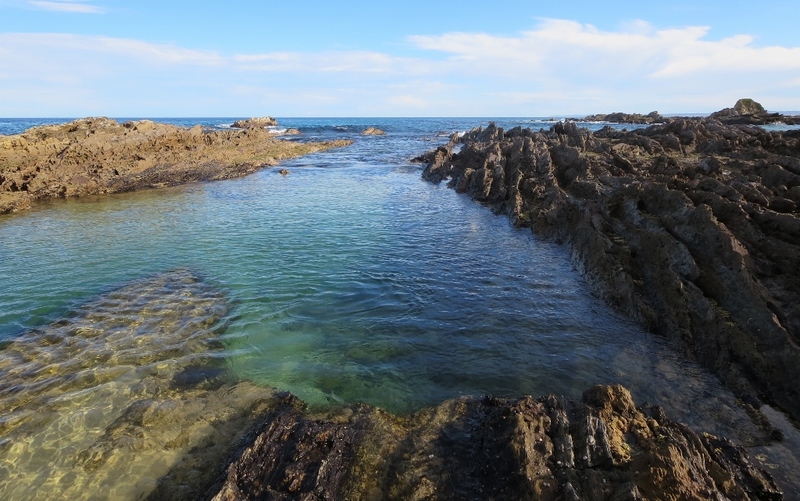 I love the inlets around Narooma, so still and calm…I’d rather be a pelican than a seal any day! 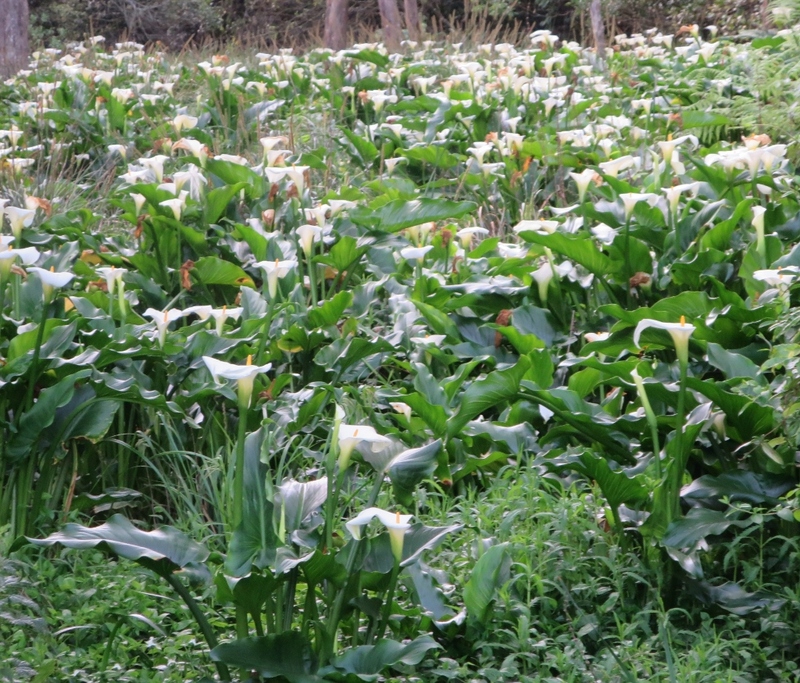 On the way home we passed a valley full of lilies…yet I have trouble growing one or two in Canberra.. Here is a hedge surrounding the car park at the local supermarket, a master-stroke of design for a public place, hardy and useful for birds. 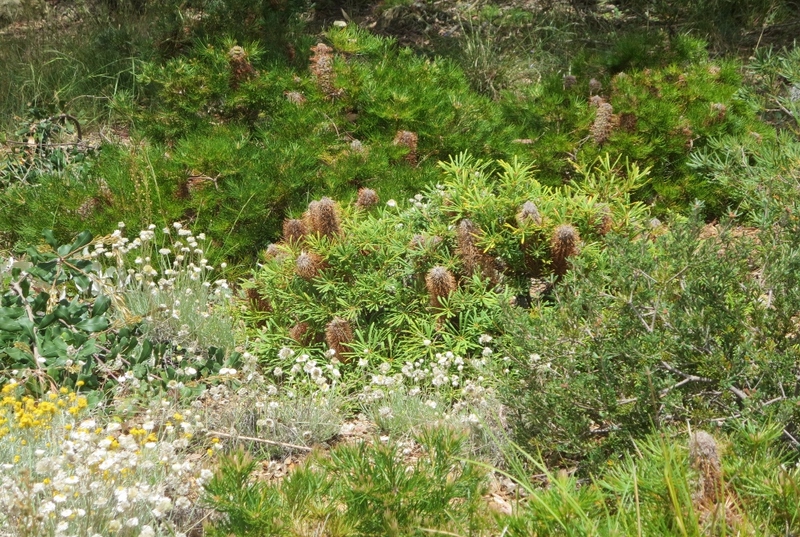 Grevilleas are planted along the southern side. 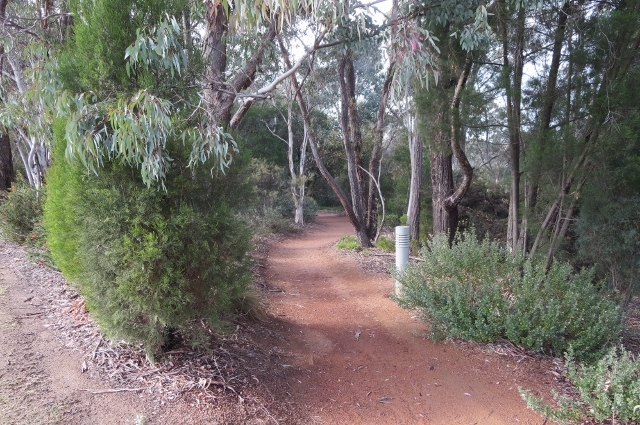 We took a quiet back track through a small forest of spotted gum trees on our way home. 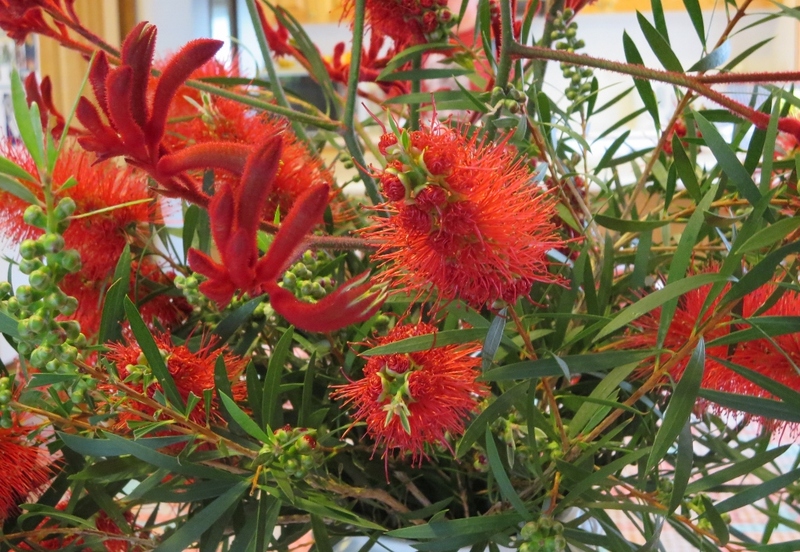 When we arrived back at our friend’s house, (Gardener Extraordinaire), her neighbours had given her some kangaroo paws and bottlebrushes from the garden. 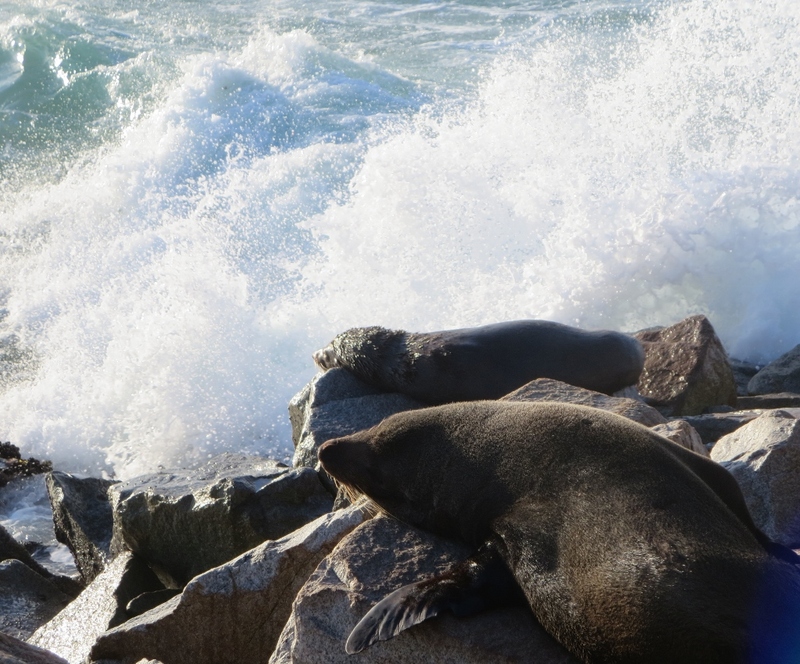 So much to see and do on a spring day at the coast! 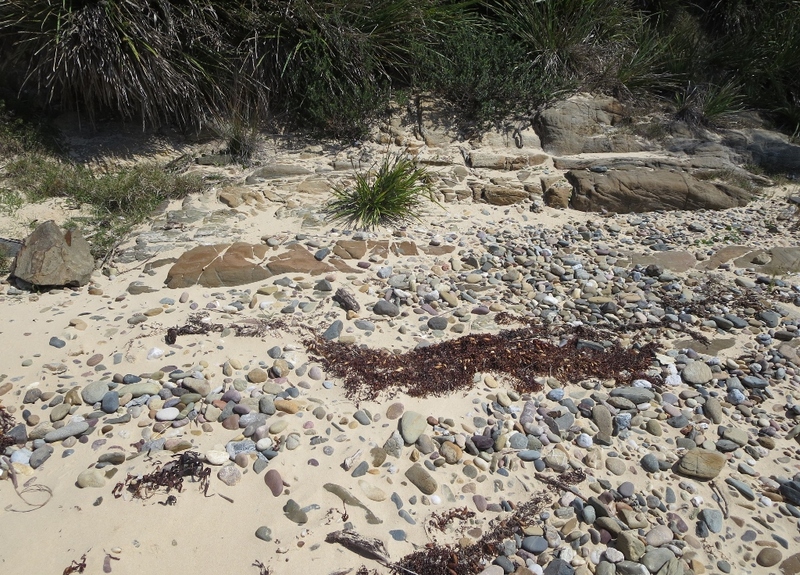 This entry was posted in New South Wales South Coast and tagged beach, Christmas, Grevilleas, Kangaroo Paws, morning, Narooma, New Zealand Christmas bush, Pademelon, pelican, rocks, sea, seals, South Coast New South Wales, spring on December 3, 2015 by germac4. 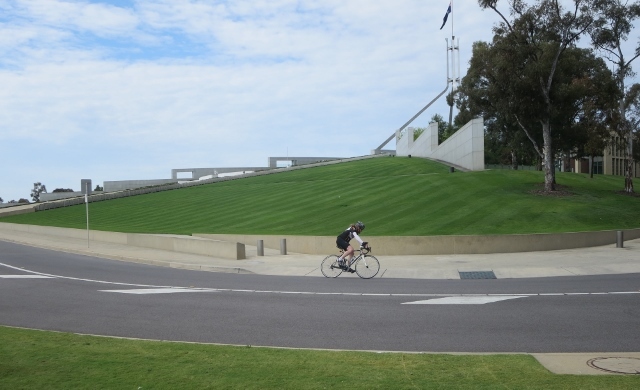 Parliament House in Canberra covers an area of 33 hectares on Capital Hill. 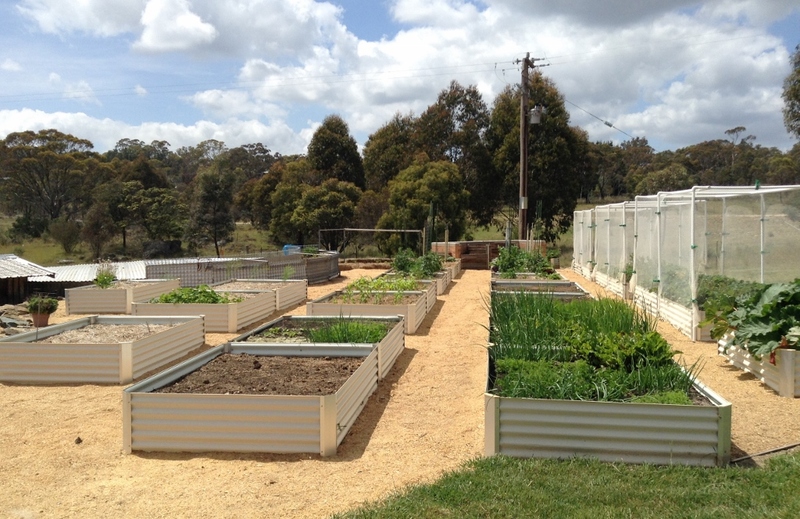 There are 10 hectares of turf (easy to see) and 13 hectares of garden beds. 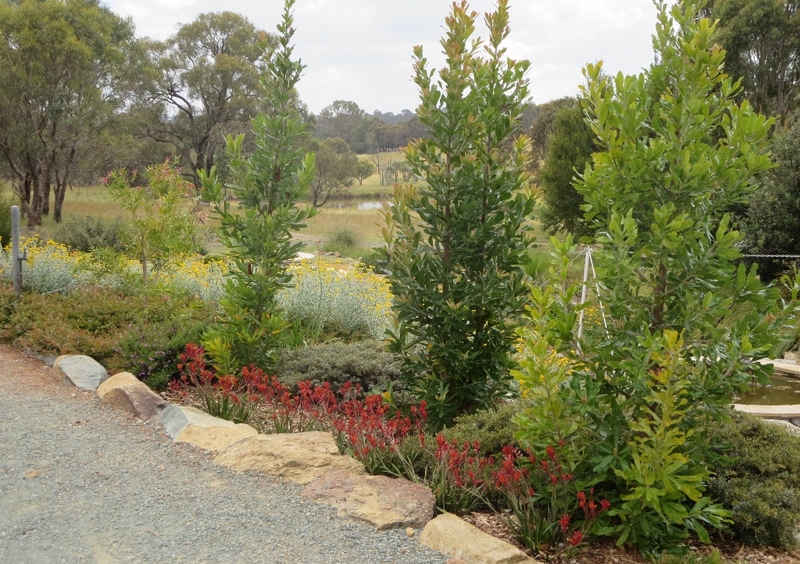 I have written a post on the courtyard gardens, but native gardens around the building actually make up about nine hectares of the gardens. 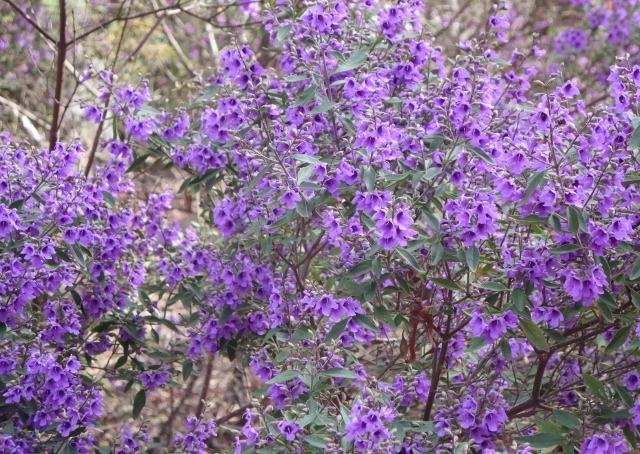 In 1988 the native gardens were originally planted as a dense understory beneath the canopy of trees. 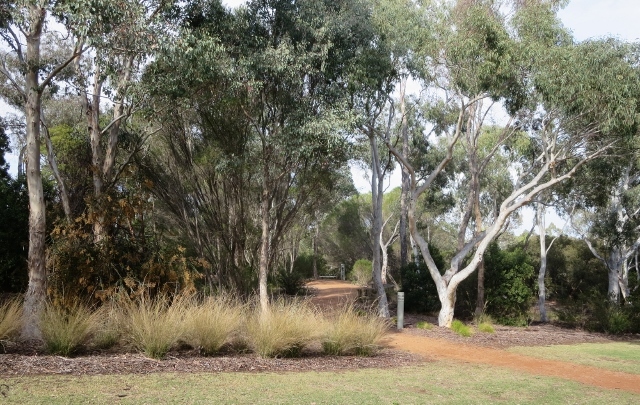 Canberra suffered a very long drought, starting in 2003 ….the native gardens were watered until 2006 when the whole region began severe water restrictions. 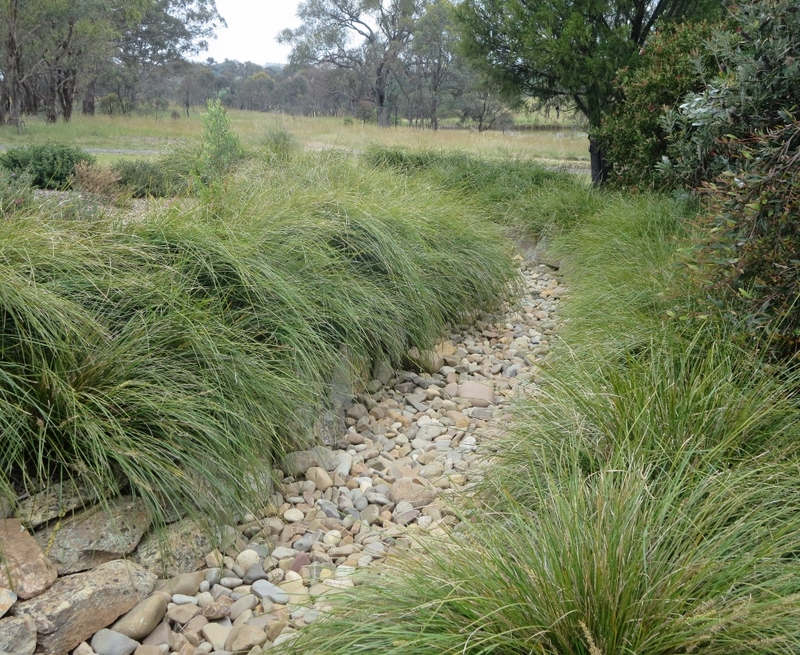 To achieve a 45 per cent reduction in water use, the irrigation of the native gardens was stopped. 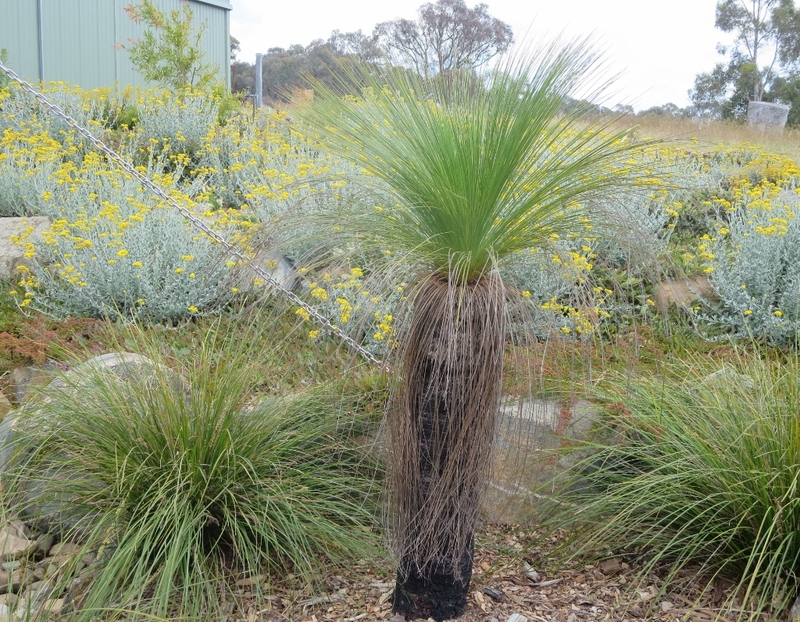 As with many gardens in Canberra, some plants were lost, others adapted well, and some were replaced by shrubs that could tolerate drier conditions. 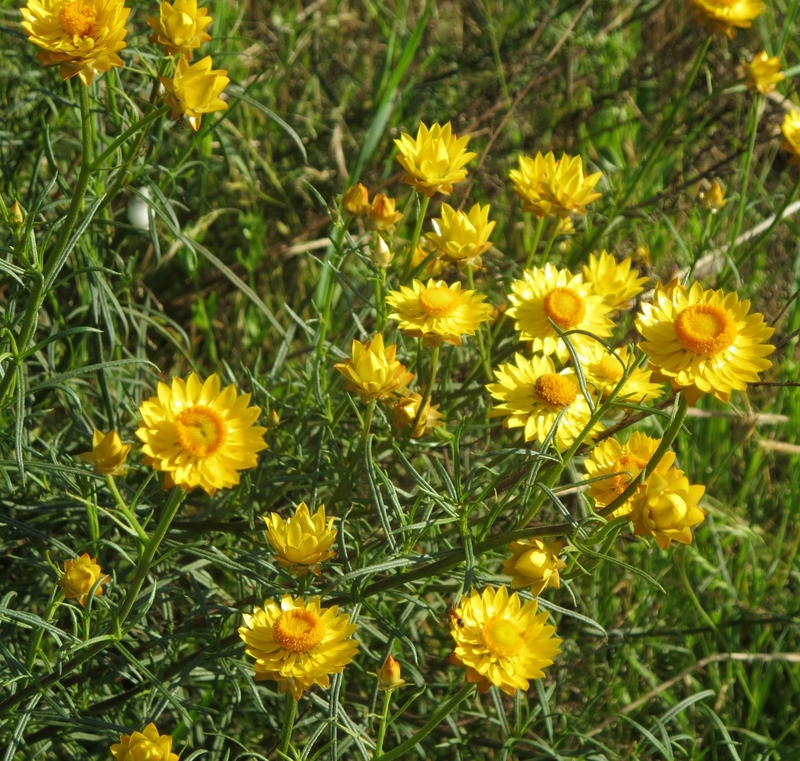 Here are some of the native plants that have survived and thrived….. 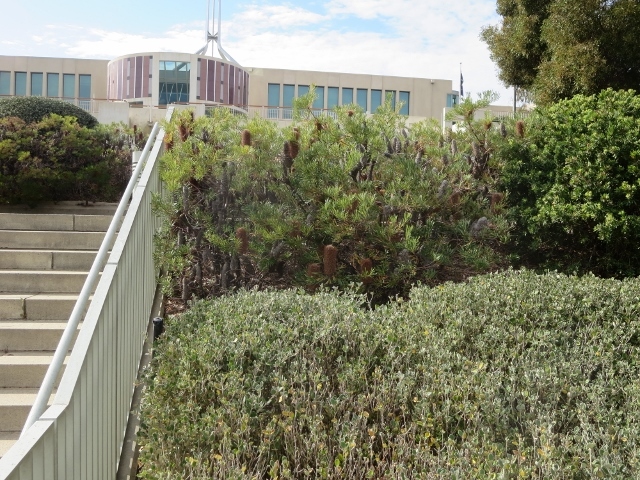 The gardens fit into the landscape so well that it is surprising to find paths winding throughout the shrubs and trees, it is easy to forget we are walking between Parliament House and a busy road! 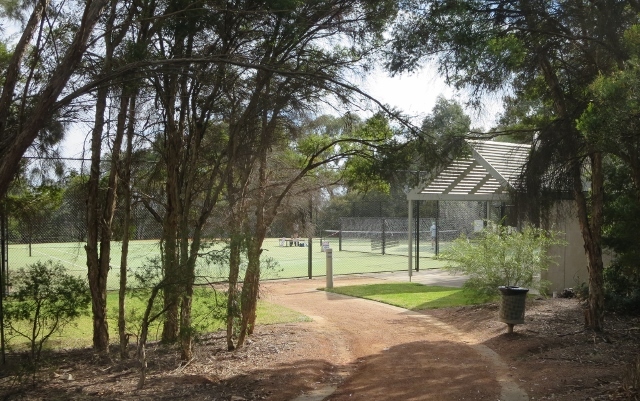 Tennis courts, for use by all parliamentary staff, are almost hidden amongst the trees..
and a Senate oval is used for volleyball, football and touch football. 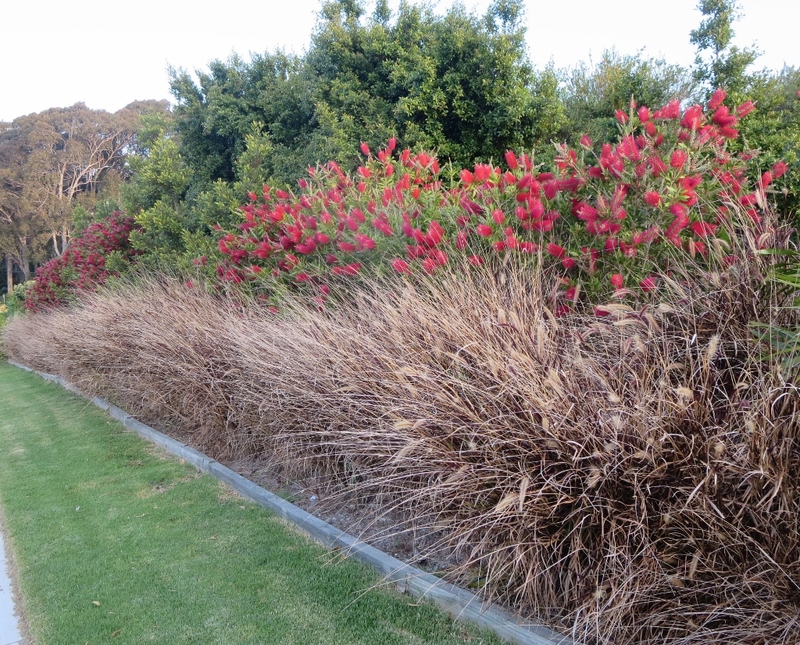 The hedge of Bottlebrushes are unfortunately not flowering yet, we’ll come back later for them. I love the white barked gum trees which can look spectacular in the evening or early morning light. 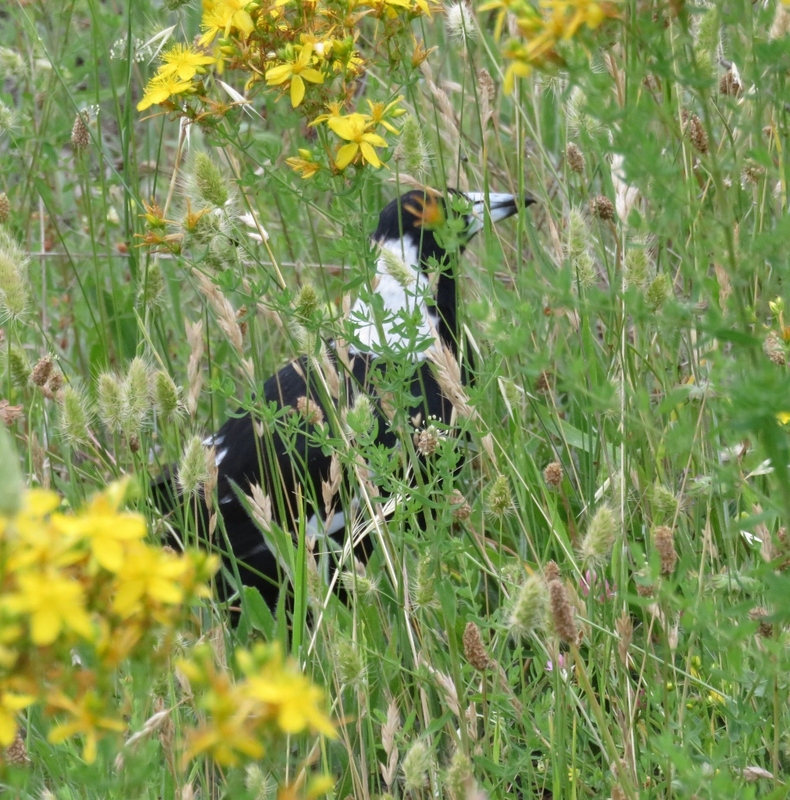 This is the perfect habitat for birds, but, today, we’ve only seen the larger birds around…. 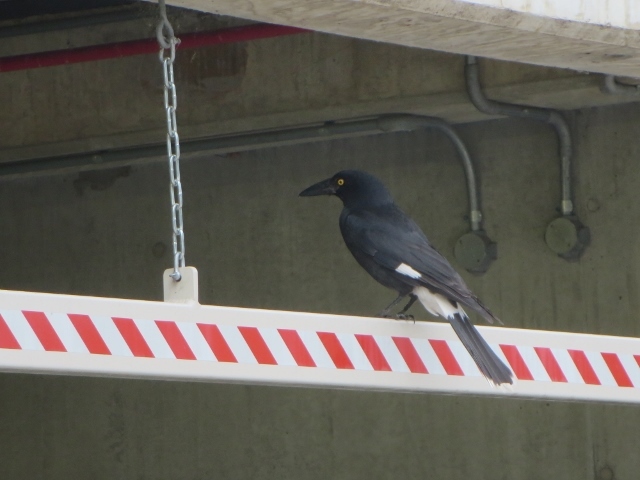 ravens, magpies, and of course…..a currawong being swooped by poor swallows as they try to defend their nest. 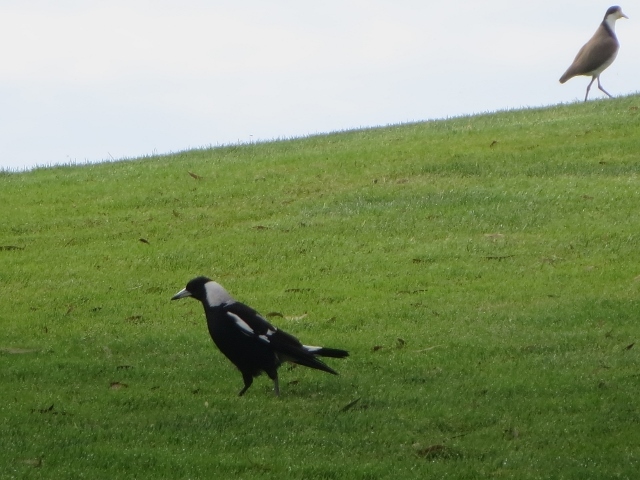 a Magpie studiously ignoring the frantic call of a Plover. 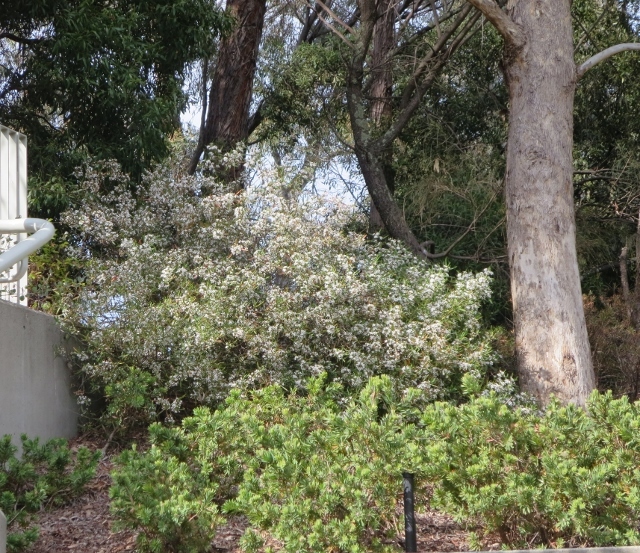 The Senate gardens are slightly different to the House of Representative gardens, so I’ll write about that in a new post. 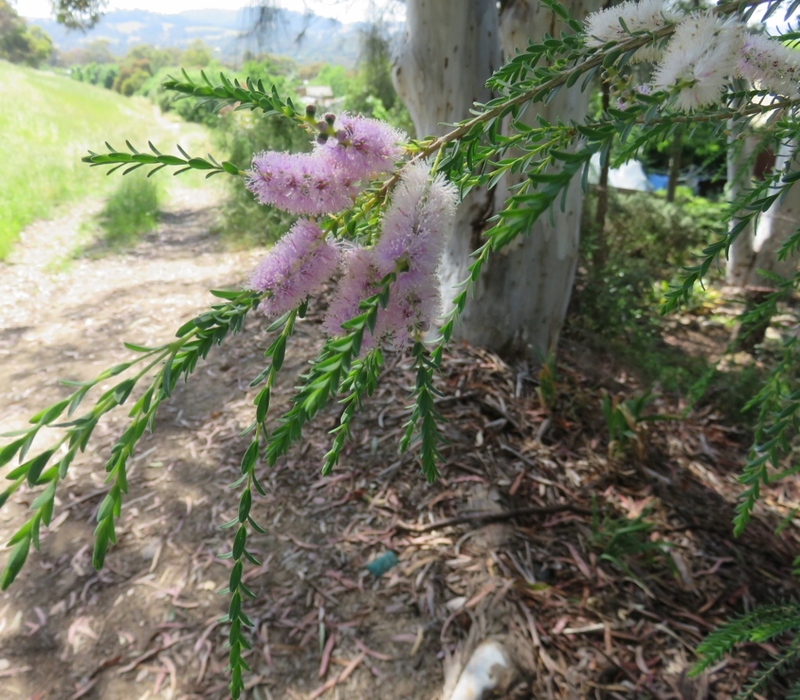 This entry was posted in Canberra's Public Gardens and tagged Banksia, birds, Bottlebrush, Canberra native gardens, currawongs, drought tolerant, Grevilleas, gum trees, Magpies, native grasses, Parliamnt House, Senate oval, Senate tennis courts, snowy river wattle on October 13, 2015 by germac4.